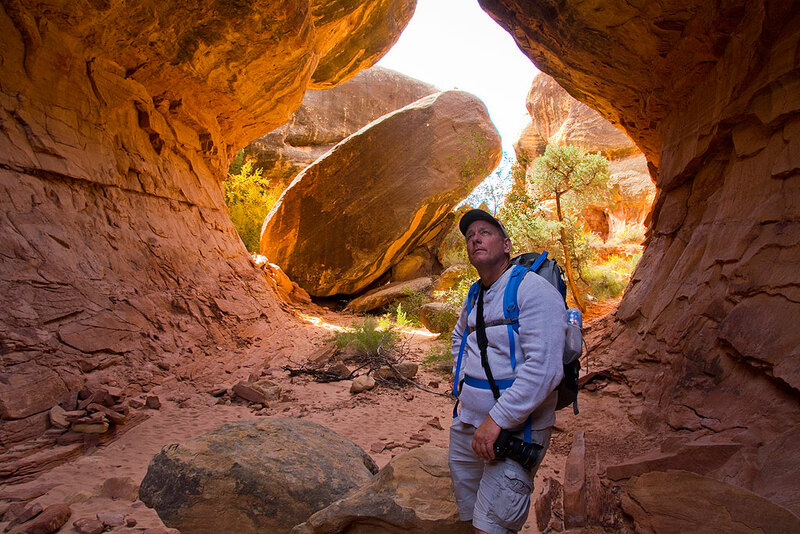 Long-time friend Scott Andersen stands at the entrance to a cave/slot on The Joint Trail at Canyonlands National Park, Utah. Abby gives me a little “whoa” as we make our way down a four-wheel-drive road in southern Utah. Among our adventures on the road west was dinner in Albuquerque with friends Greg and Terry Smith. I hiked and made pictures with Greg on a few occasions, but Abby had never met them. 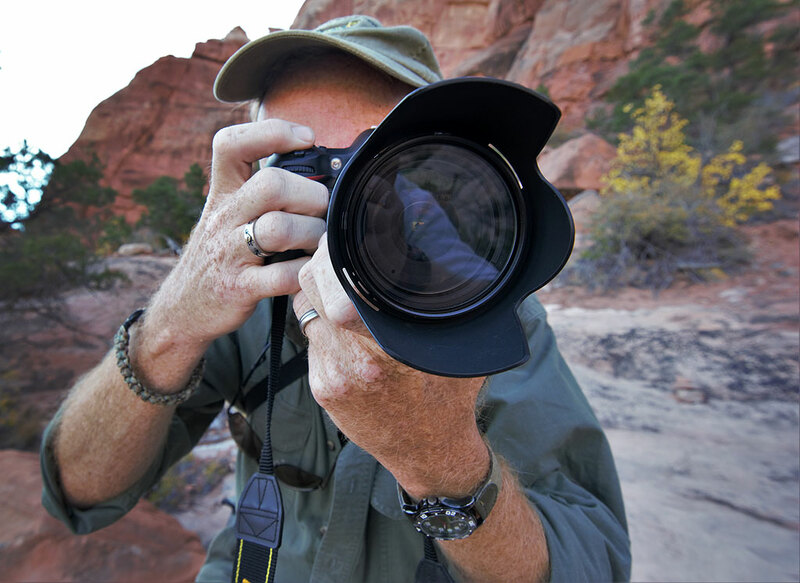 As Greg nears retirement, he becomes more interested in fine art photography as well as shooting his impressive collection of firearms, so there was no shortage of conversation. 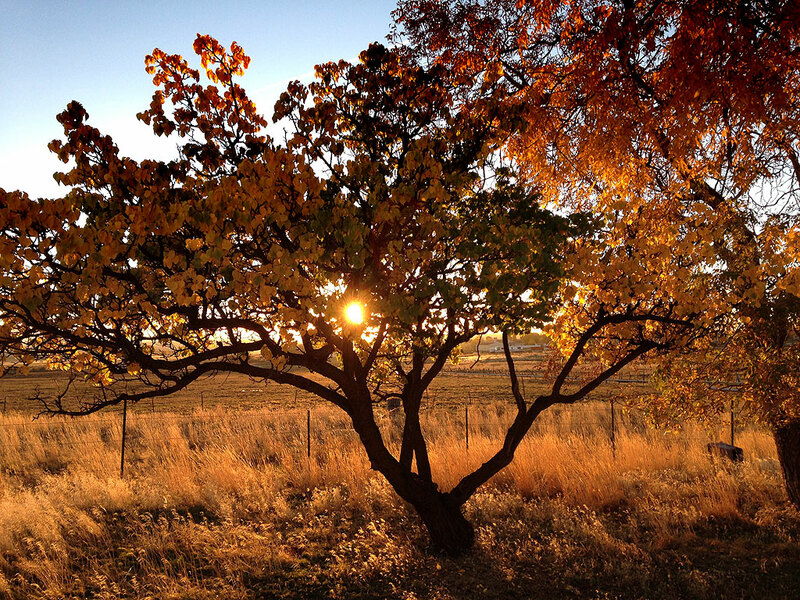 This was my view each morning when I walked the dogs at our motel in Monticello, Utah. 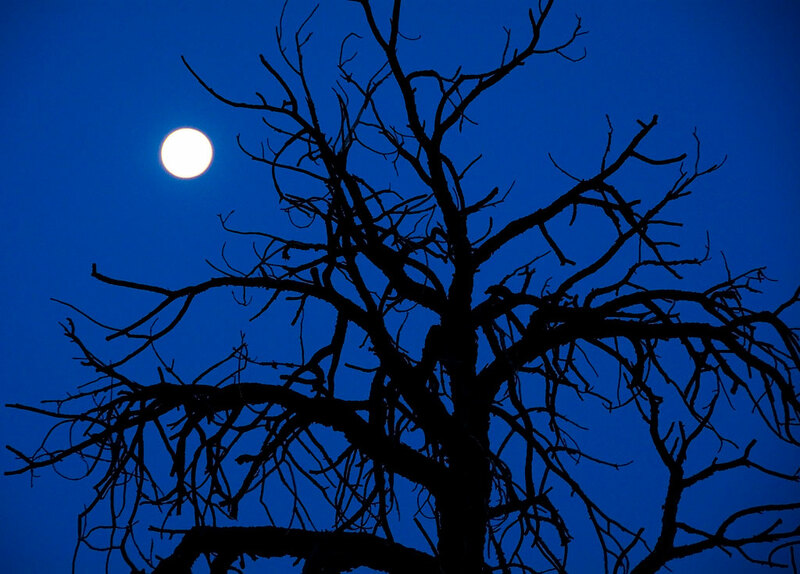 The moon sets behind a tree in southern Utah. From Albuquerque to Monticello, Utah, I decided to take a route through Window Rock, Arizona and Sheep Springs, New Mexico which we’d never seen before. 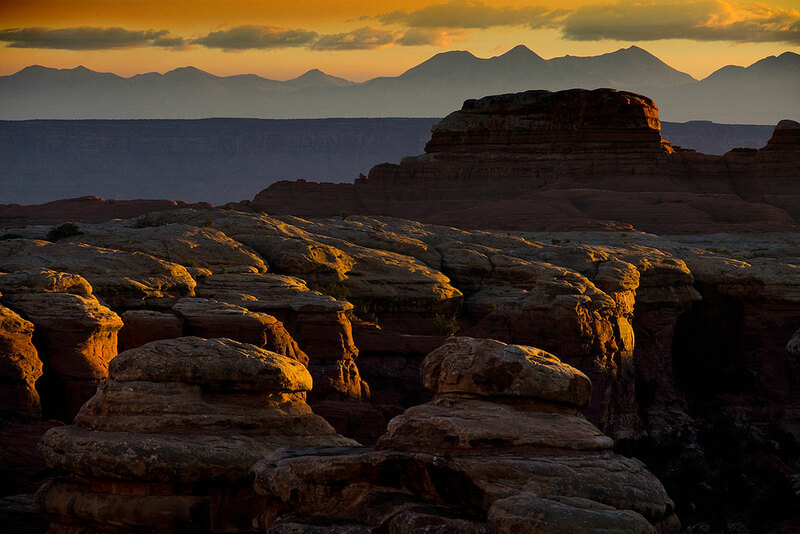 Since so much of the Four Corners region is beautiful and mesmerizing, I felt we couldn’t go wrong. 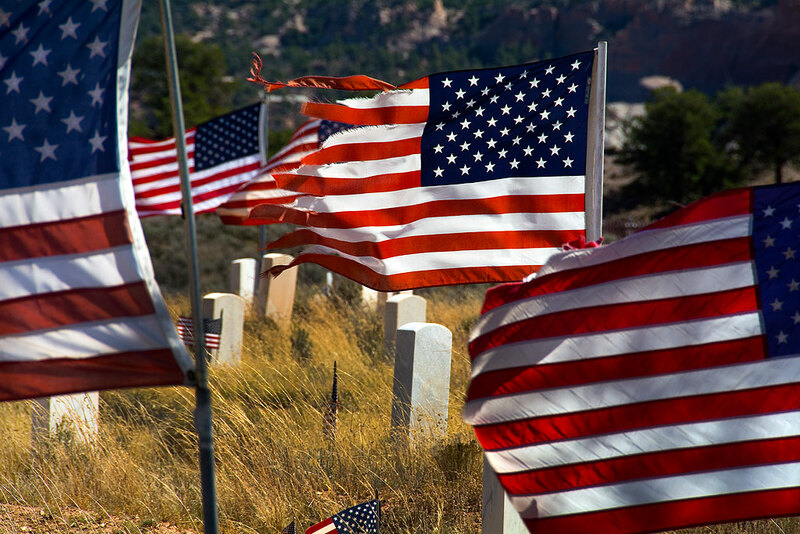 Just north of Window Rock we spotted an impressive Veterans cemetery awash with U. S. flags. 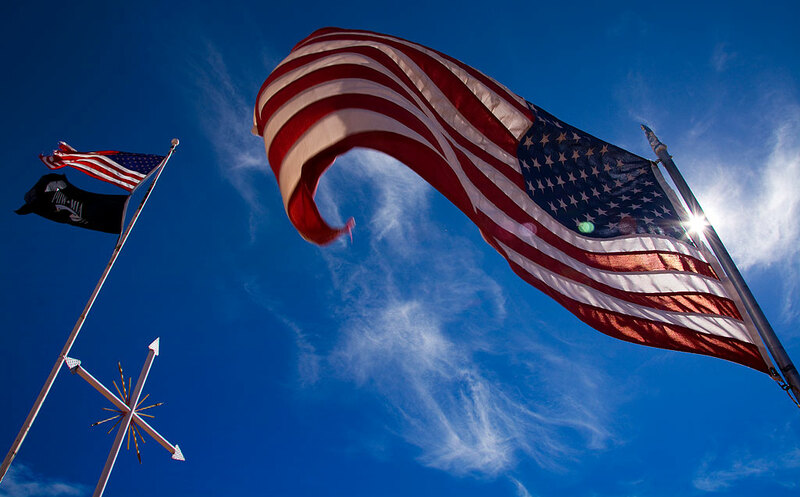 U. S. flags flutter in a steady breeze under gorgeous skies near Fort Defiance, Arizona. Abby was particularly moved and impressed by the tattering on the edges of these U. S. flags. Farther down the road we crossed the southern end of the Chuska Mountains and made some nice images. The sky continued to be cooperative as we neared the Chuska Mountains near the Arizona/New Mexico border. 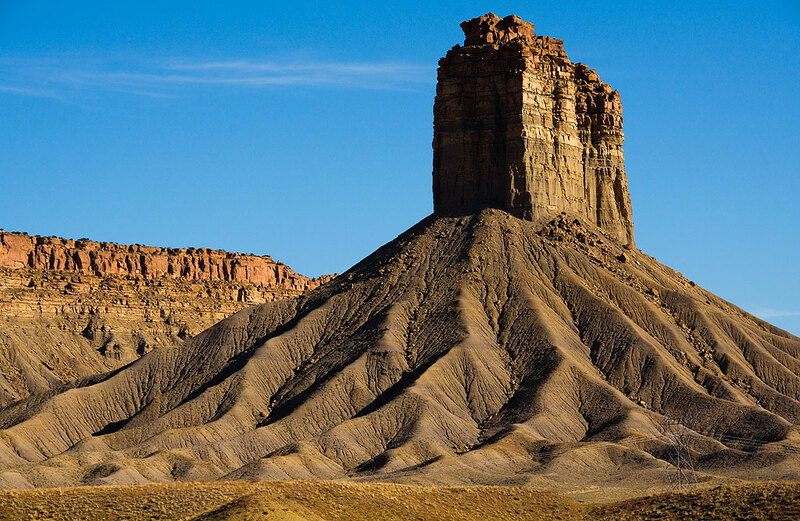 Chimney Rock near the Colorado/New Mexico border looks commanding in maturing afternoon light. 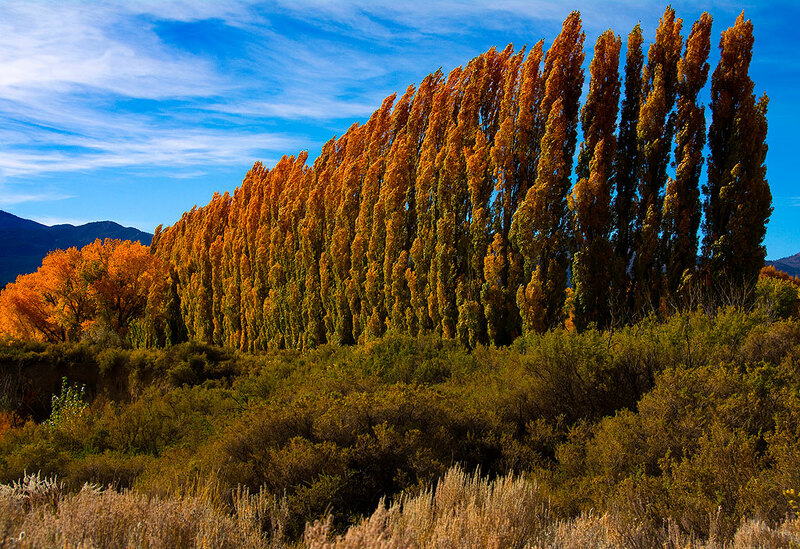 Poplars pick up strong afternoon sunshine on U. S. 491 near Cortez. Abby smiles as she patiently waits for me to finish photographing Chimney Rock near Cortez, Colorado. We rejoined the familiar U. S. 491 (formerly 666) at Sheep Springs, New Mexico, and enjoyed being on the road, stopping periodically to make pictures. 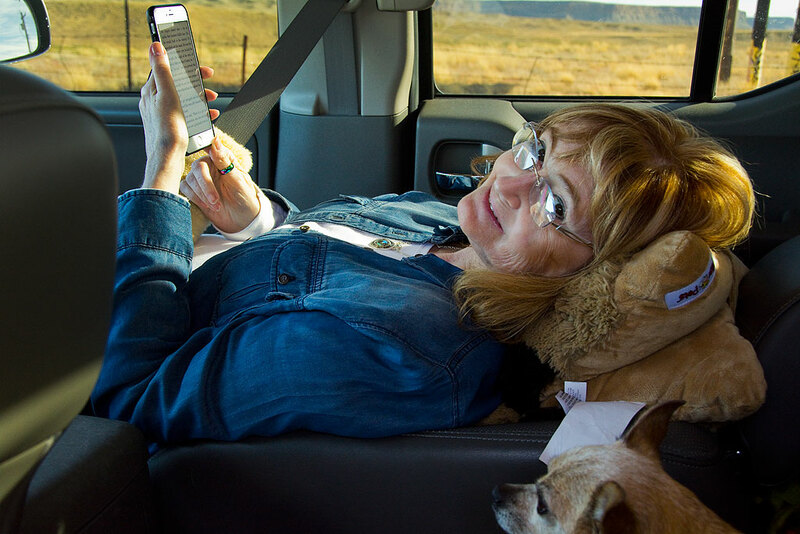 By late afternoon we rolled into Monticello, Utah, our headquarters for the week. We were joined for dinner by our long-time friend Scott Andersen. 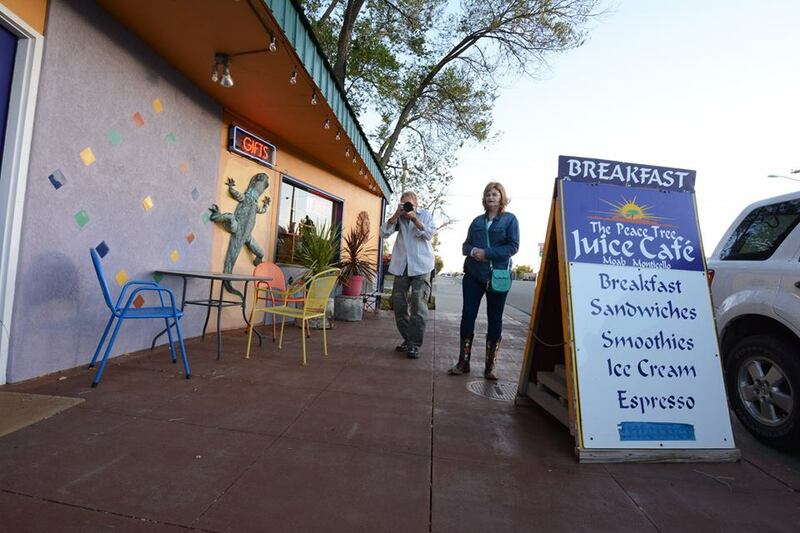 Scott made this image of Abby and me as we arrived at The Peace Tree Café for dinner. Abby stands outside the Horsehead Inn in Monticello, Utah. Years ago this place was the MD Ranch Cookhouse, but closed, and just recently reopened. Abby and I have come to prefer smaller towns as base camps for our vacations, if for no other reason than to get away from the trappings common to mainstream America: big box stores, traffic, city noise, commerce. This is also why I like camping, particularly camping far back into wilderness, like my camping experience in April 2015. Abby and I made images of each other similar to this ten years before. In 2006, this restaurant was the MD Ranch Cookhouse, which later closed, and recently reopened as the Horsehead Grill. The interior, however, is exactly as we remembered it. Small towns are friendlier and easier: the restaurants are home-owned, the convenience stores are staffed by local high schoolers, it takes five minutes to go from town to country. 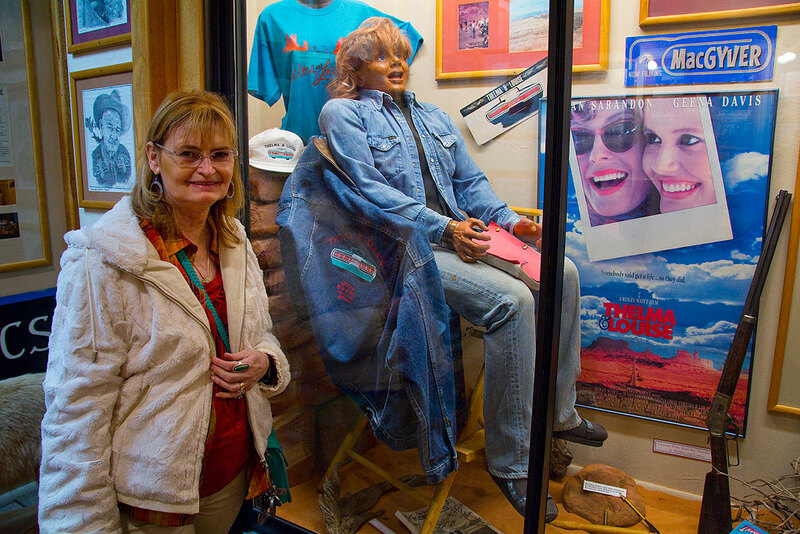 On this occasion, we stayed in Monticello, Utah, 58 miles south of Moab, Utah. 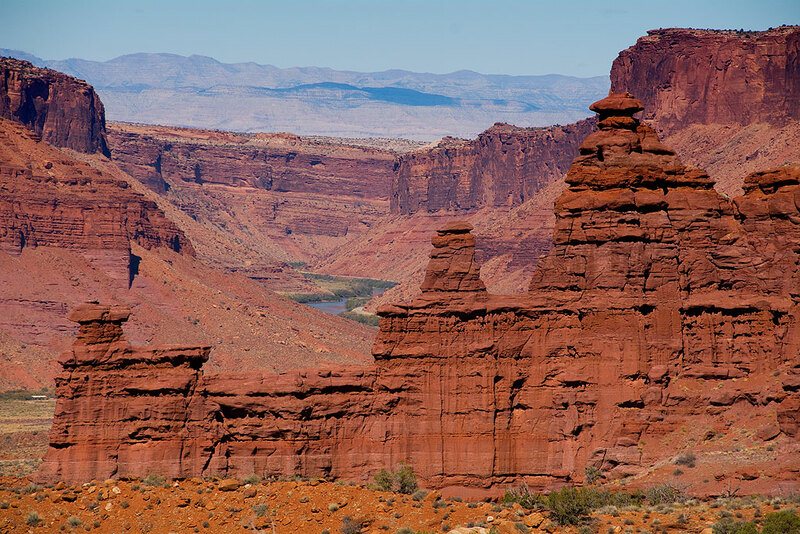 Moab has changed considerably in just the 12 years since we got married there, and we don’t like it much any more. 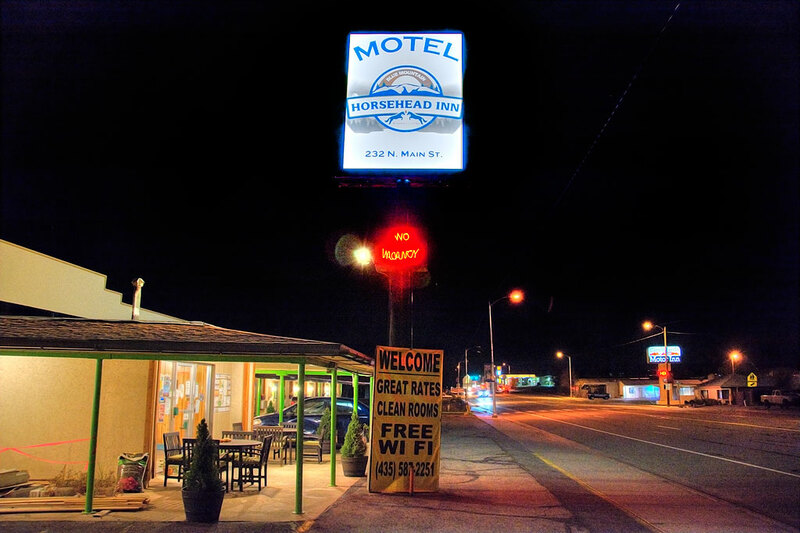 In years past, our motel was called the Navajo Trails, but seems to have changed ownership, and it now the Horsehead Inn. It is affordable and charming. 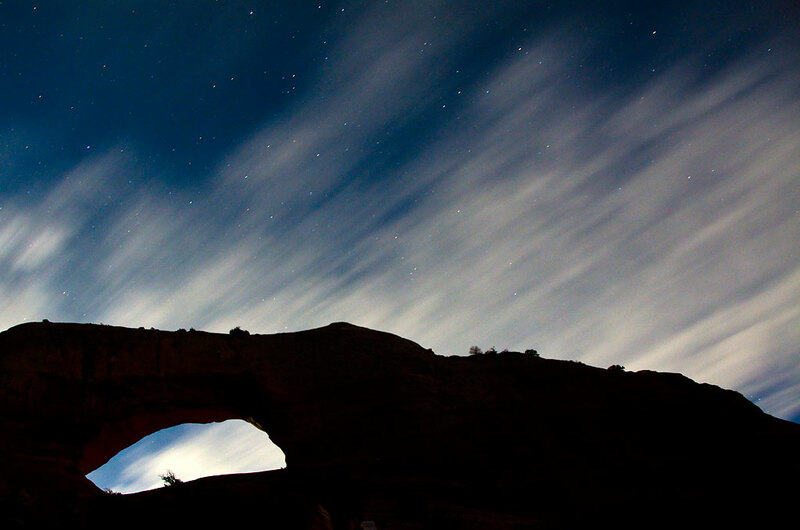 This 30-second exposure shows stars and clouds silhouetted against Wilson Arch. 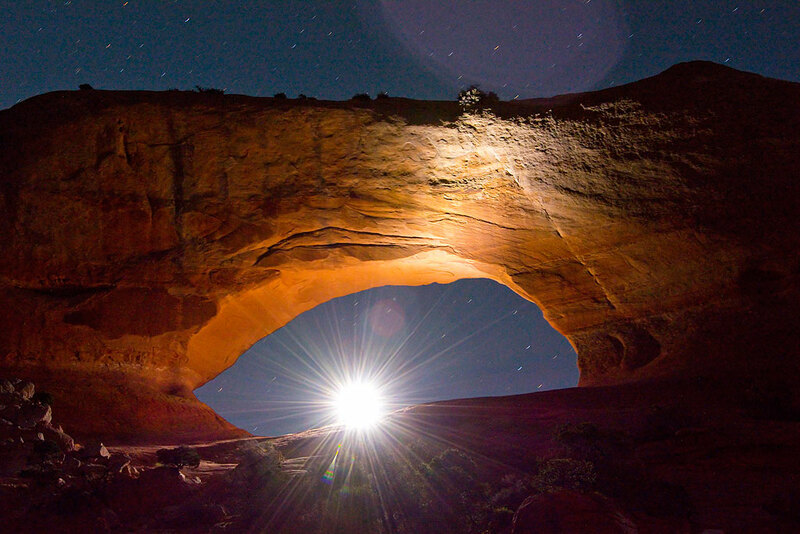 Scott invited me to photograph nearby Wilson Arch after dark. I have photographed Wilson Arch for many years (since it is easy to access and near my destinations), including at sunset and in the snow, but this was the most unusual instance. As Scott and I approached the arch from the south, we saw flashes coming from the arch, and couldn’t quite fathom why. Were people making selfies with their on-camera flash? Scott and I made some exposures from the base of the slope below Wilson Arch, with the help of a photographer at the arch and his flash. We later hiked up to join him. 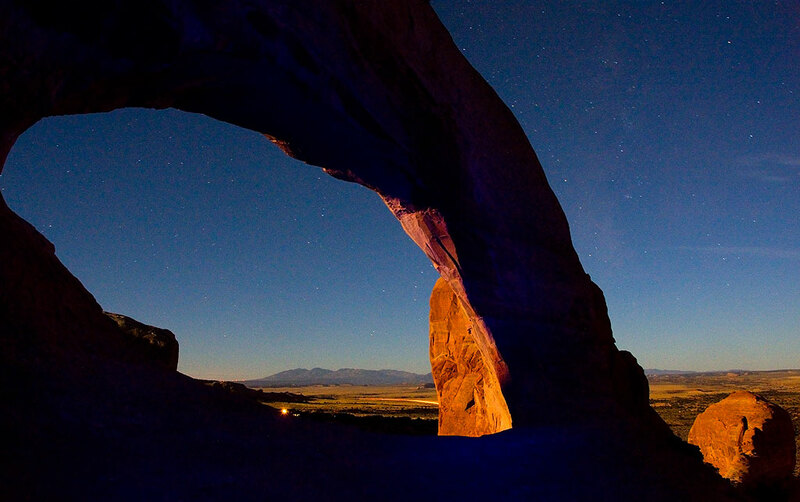 When we got out of the car, we saw what appeared to be a photographer using a flash to “paint” the arch with light. After making some images at the base of the slope, we hiked up and met the photographer, Adam Hynes. He was making a long series of multiple exposures to “stack” together in Photoshop, a technique just outside of my own idiom, one requiring considerable patience and devotion. This 30-second exposure shows Wilson Arch illuminated by the rising moon and a little bit of light from my blue flashlight. 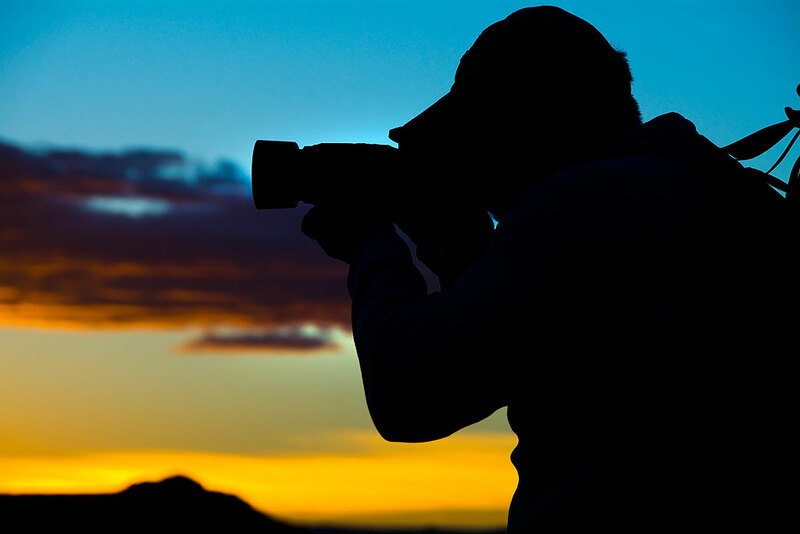 Scott is silhouetted against the pre-sunrise sky on the trail at Canyonlands. With Abby’s blessing, Scott and I met at 5 a.m. hoping to be in a great spot for sunrise. 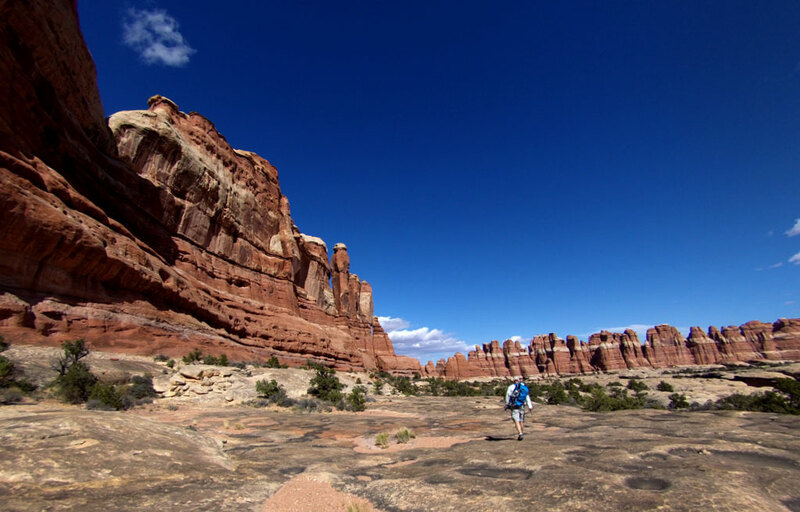 We loaded up on coffee and headed north to the Needles District at Canyonlands National Park, an old haunt of mine, with the goal of hiking to the Joint Trail, one of the few I’d never seen. 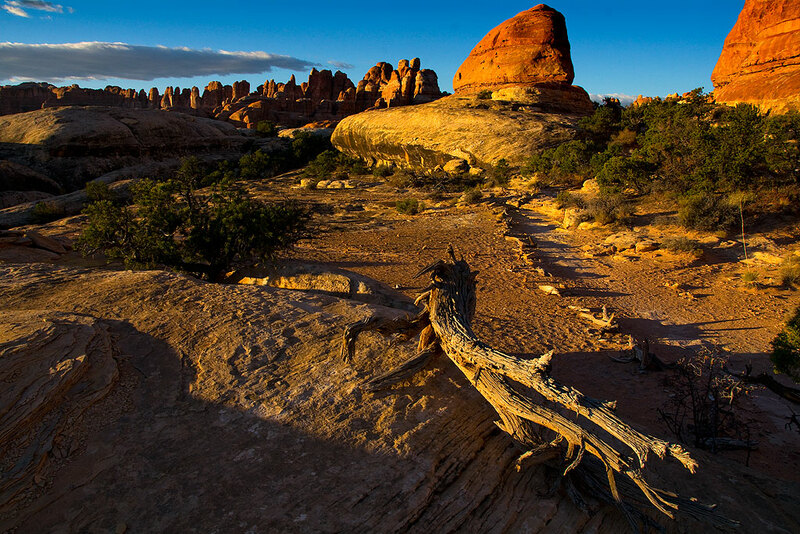 We made better time than I expected, and were on the Chesler Park trail as the sun rose. 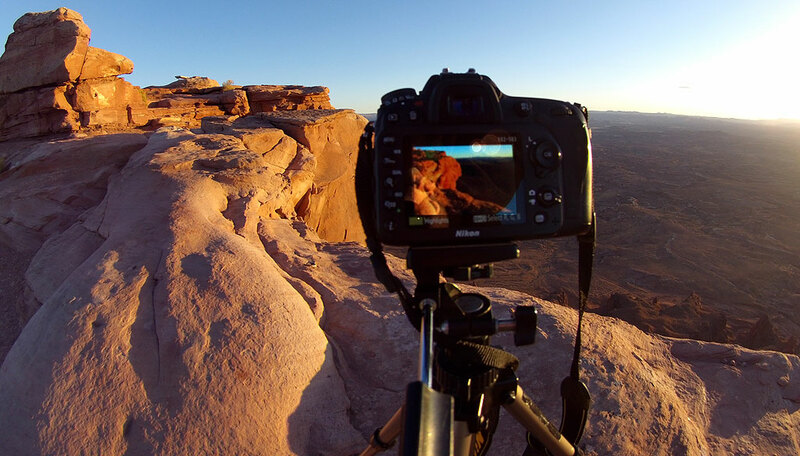 I use my Ion Air Pro 3 to make video on the Chesler Park Trail at Canyonlands at sunrise. 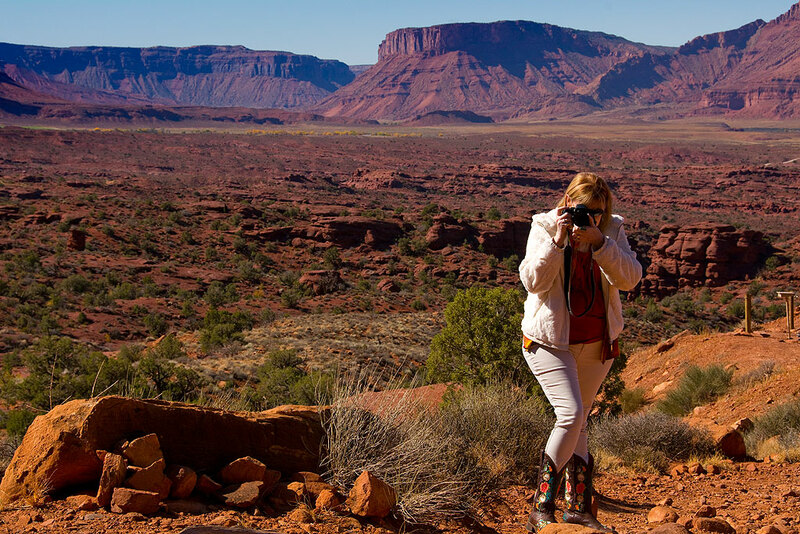 Your host makes pictures as our Canyonlands hike progresses. Scott and I hike at a similar pace and seem to have similar abilities and similar photographic goals. Scott carried much more than I did. 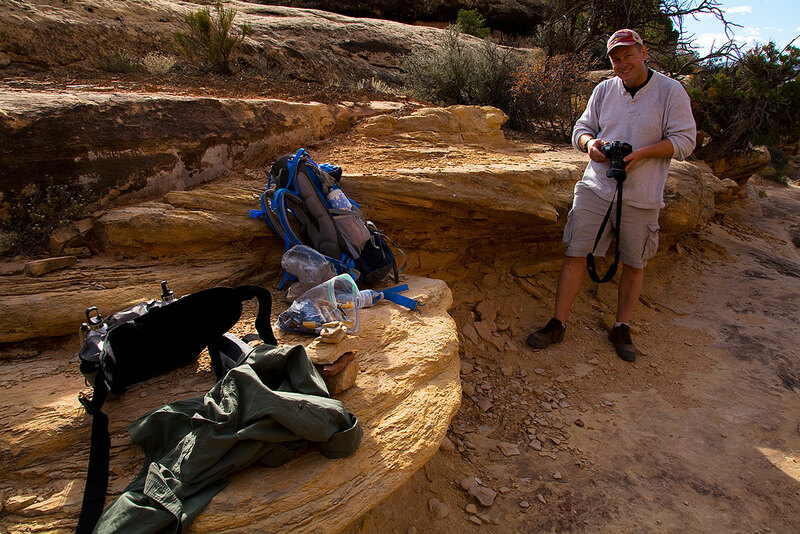 I tend to minimize, but Scott brought more water, more food (including apples), and more photographic gear that I ever carry on the trail. Early light shines on clouds as our hike begins. 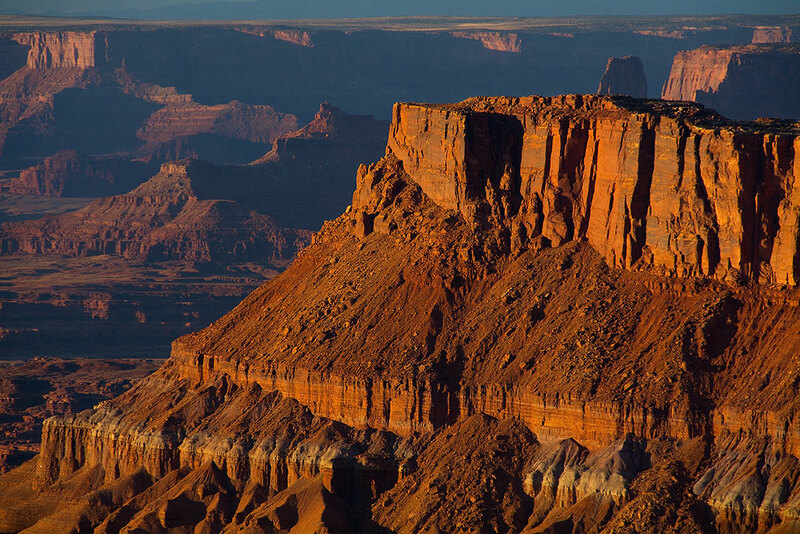 Deep, brooding first light shines steeply across the Cedar Mesa Sandstone of the Chesler Park Trail at Canyonlands. 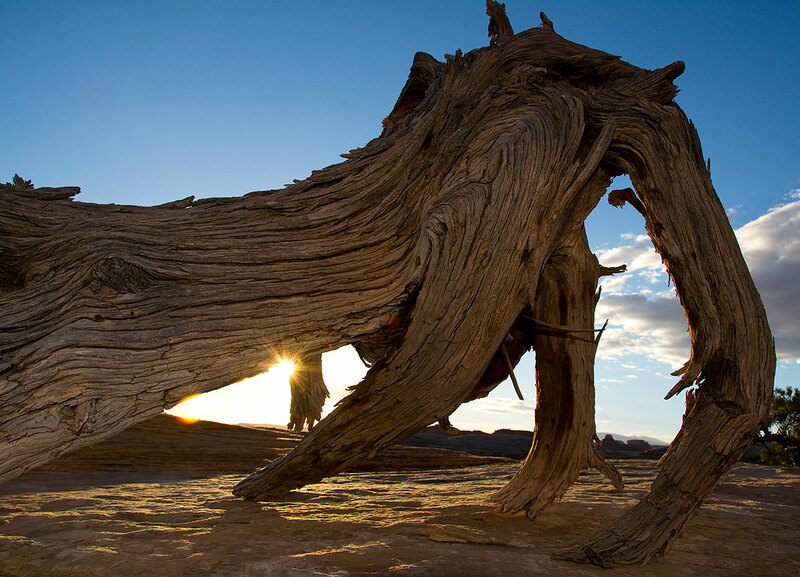 The rising sun peeks through a piece of dead wood on Canyonlands’ Chesler Park Trail. 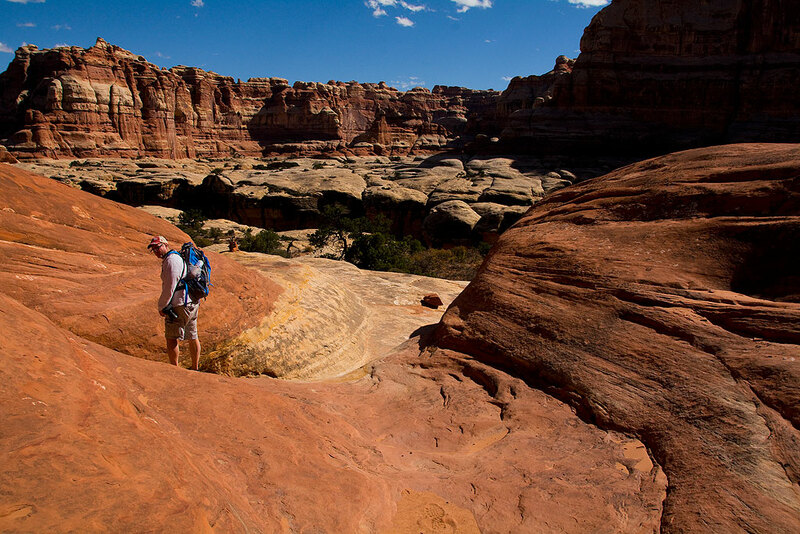 The weather was ideal and we moved through the beautiful mixed terrain of Canyonlands swiftly. 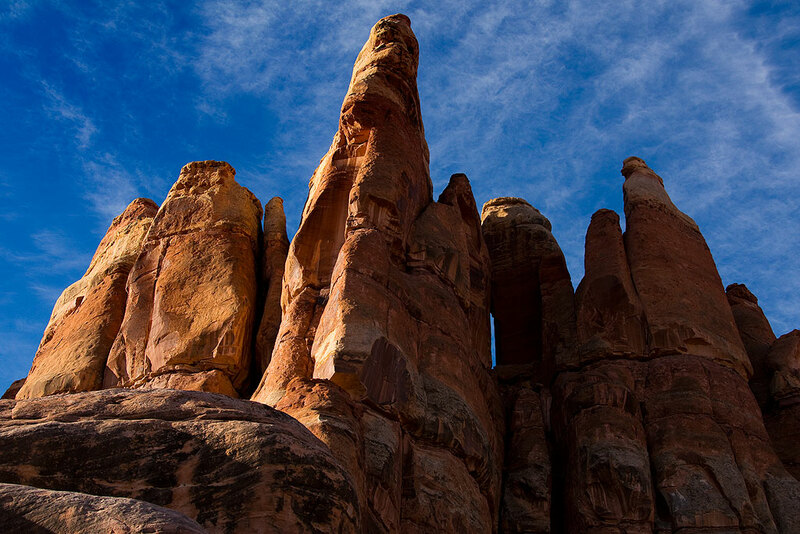 These tall peaks rise near the heart of the Chesler Park Trail. 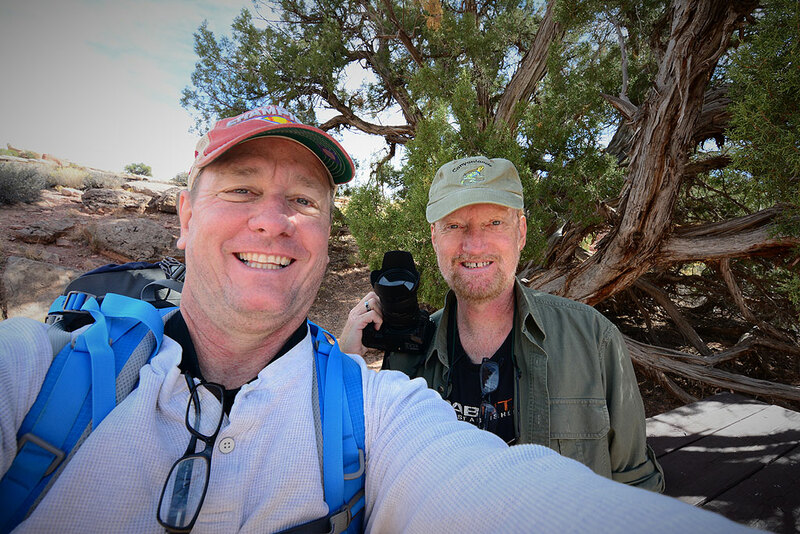 Scott and I stop for a food break at the apex of our hike, which totaled about 11.5 miles. 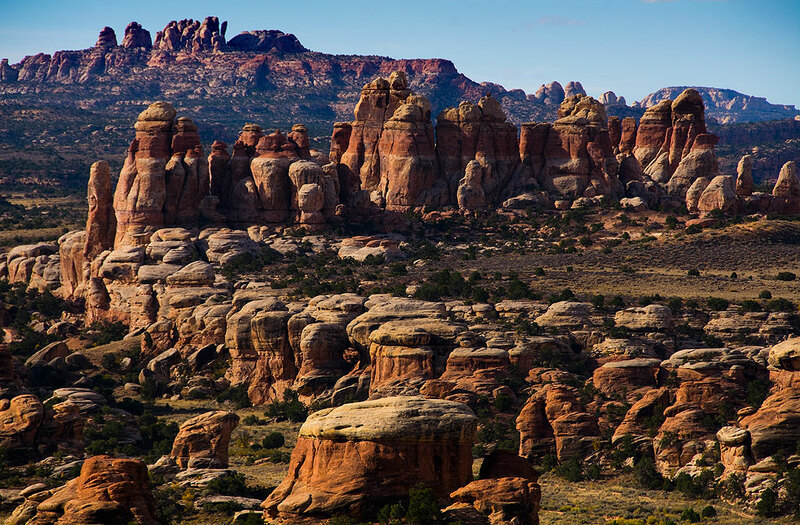 This view was made looking southeast in the heart of Canyonlands on the Chesler Park Trail. 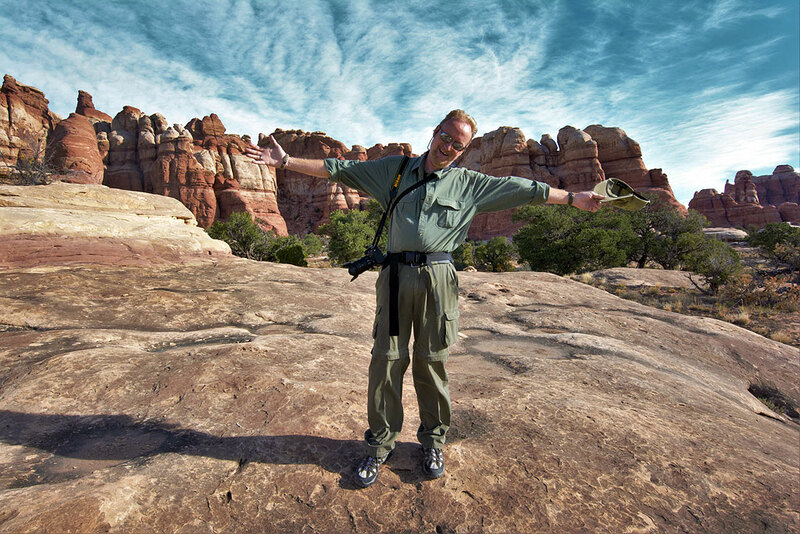 Your host strikes an elated pose as we hike the Chesler Park Trail at Canyonlands. …as I photographed him with his camera. 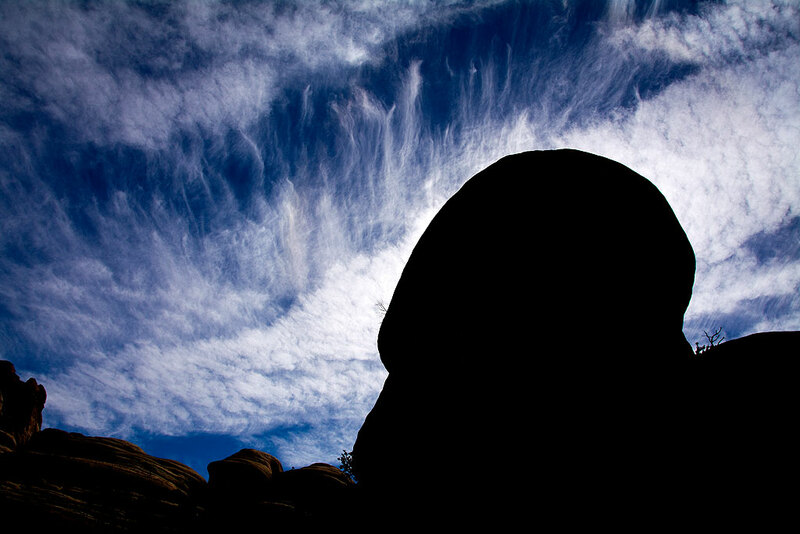 Near the west end of the Joint Trail we saw this stone formation set against the endless sky. 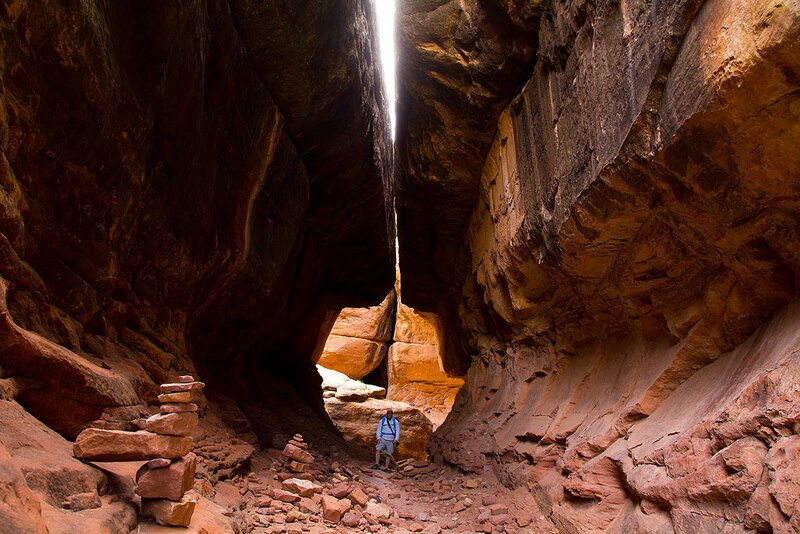 Your host explores a maze of cracks and slots on the Joint Trail deep in the Needles District of Canyonlands. 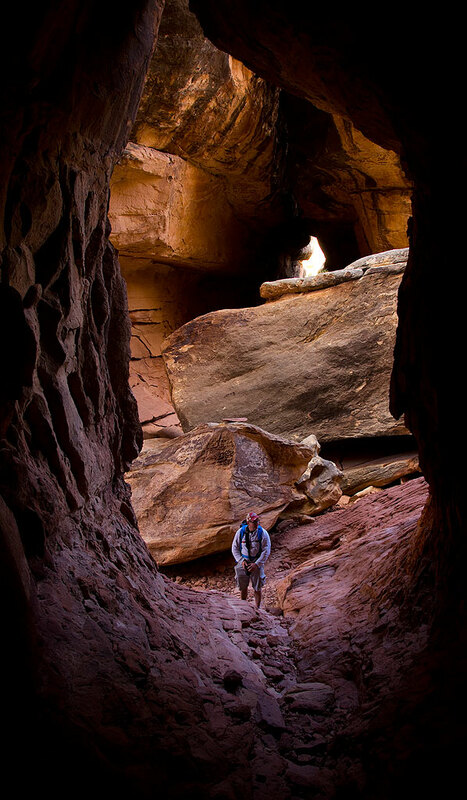 A long cave led up out of the Joint Trail for some distance, shown here from the end of the cave with Scott shown at its entrance for scale. 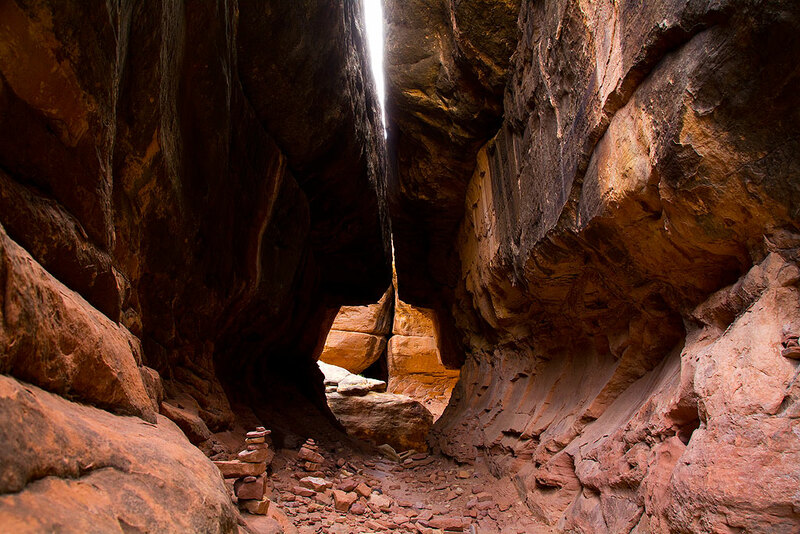 This is “the keyhole,” a notable spot on the Joint Trail at Canyonlands. 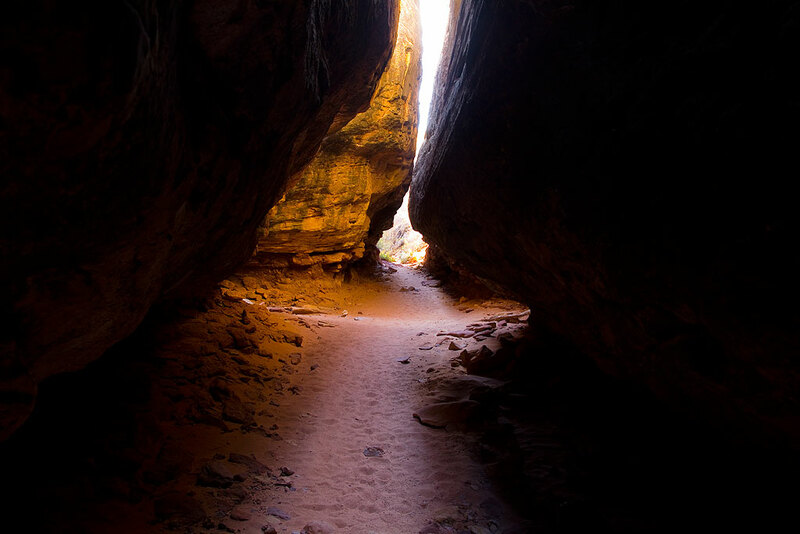 Much of our trail was familiar to me, but our stated goal was a trail deep in the heart of The Needles, the Joint Trail, noted for its soaring cave-like structures and narrow slots. We arrived in late morning, and were not disappointed by the sights. 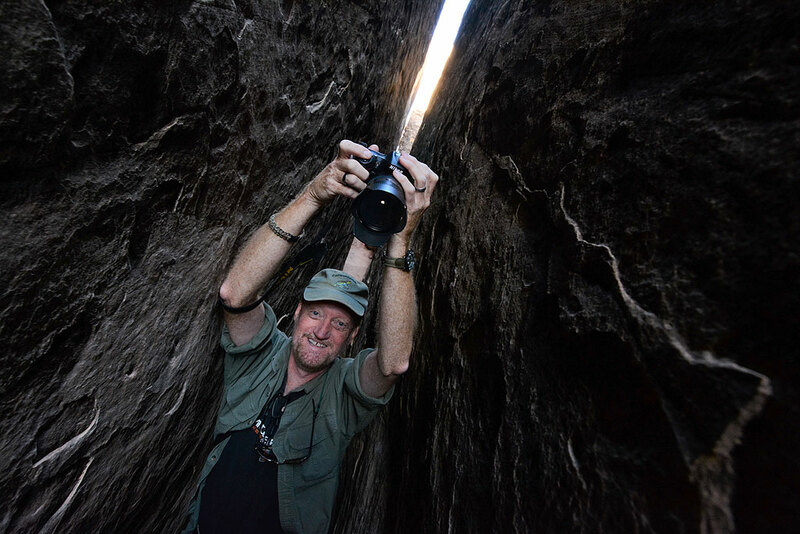 The area lent itself well to exploration and imaging, and we both had an amazing time. We made a loop back to the Chesler Park Trail, then descended into Elephant Canyon, a route I hadn’t seen since 2002. We kept open the option of turning south at the bottom of the canyon and hiking the two miles to Druid Arch, but by the time we got to that intersection, daylight was becoming a factor, so we made our way back the Elephant Hill trail head, then back to Monticello. 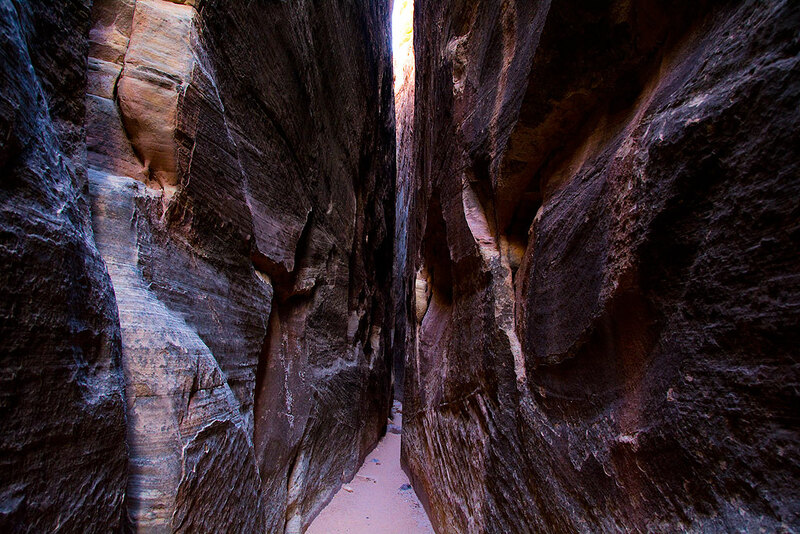 The deep slots of the Joint Trail take on blue light from their only light source, the blue sky high above. 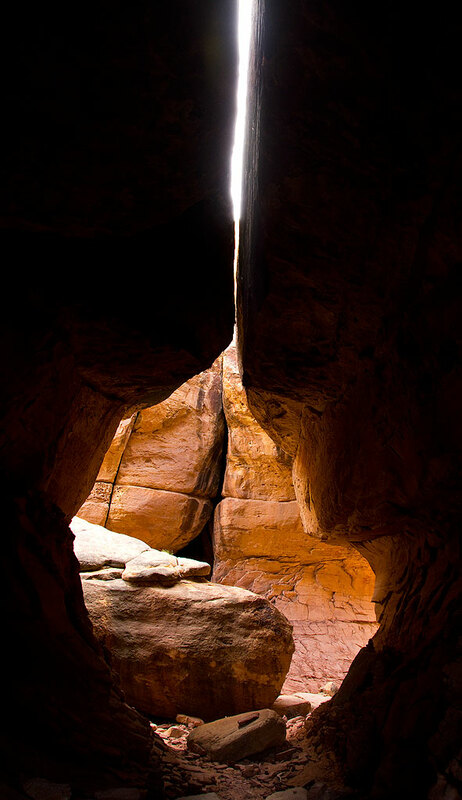 At the heart of the Joint Trail is this impressive cave-like formation. This view looks the opposite direction as the previous image, with Scott in the middle of the image for scale. 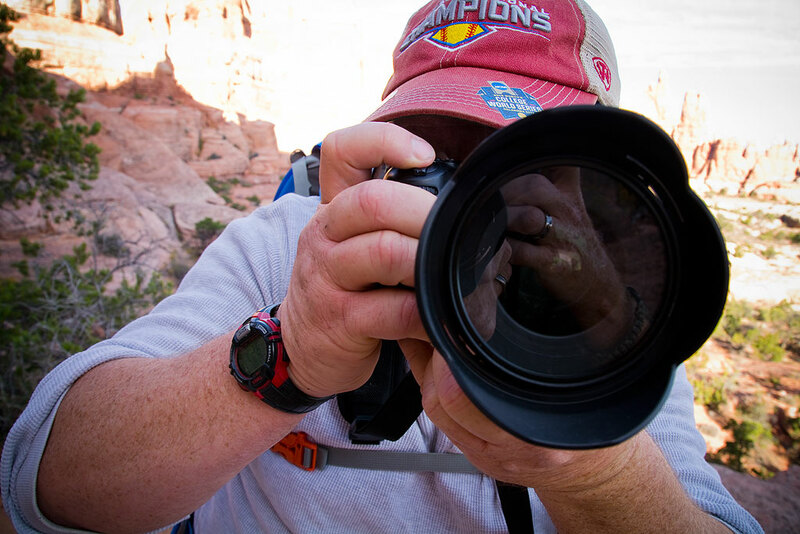 Scott made this image of me trying to make pictures in a narrowing slot in the vicinity of the Joint Trail at Canyonlands. Another narrow slot forms a portion of the Joint Trail. 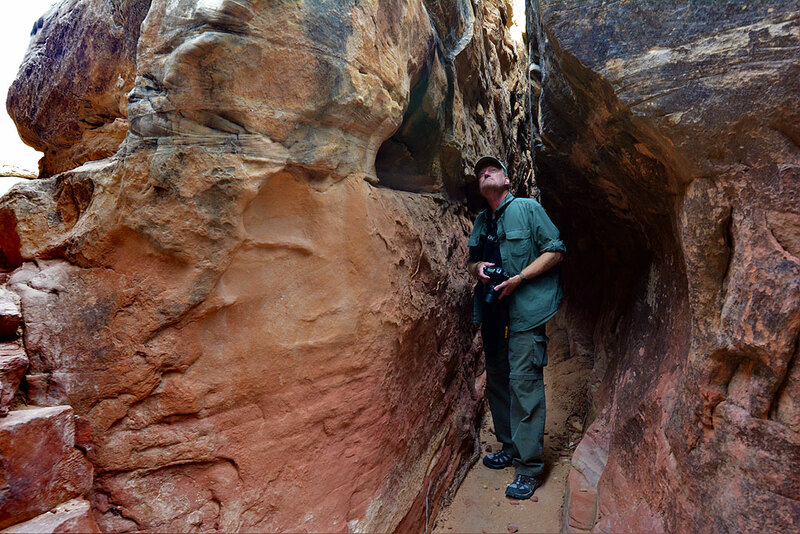 Scott looks up at the center of the Joint Trail’s rock formations. 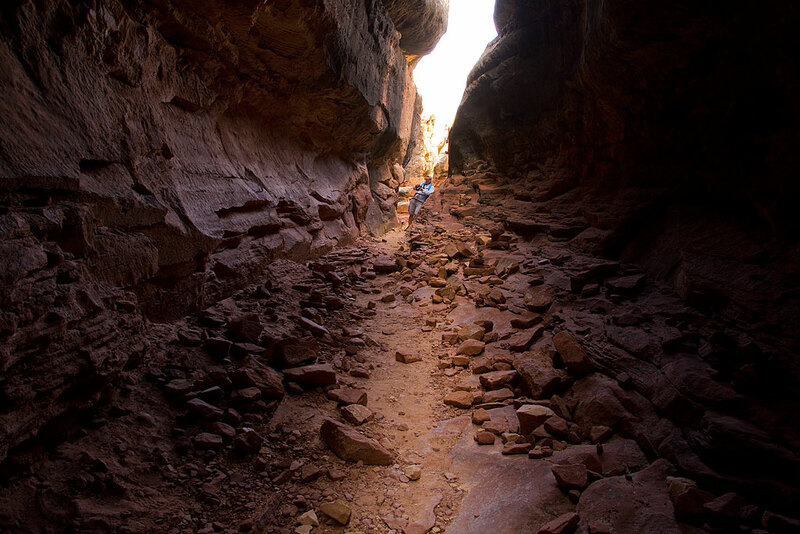 Scott made this picture of us deep in the heart of Canyonlands. We have been friends for most of our lives. I think I can speak for him when I say that we both had a great time. 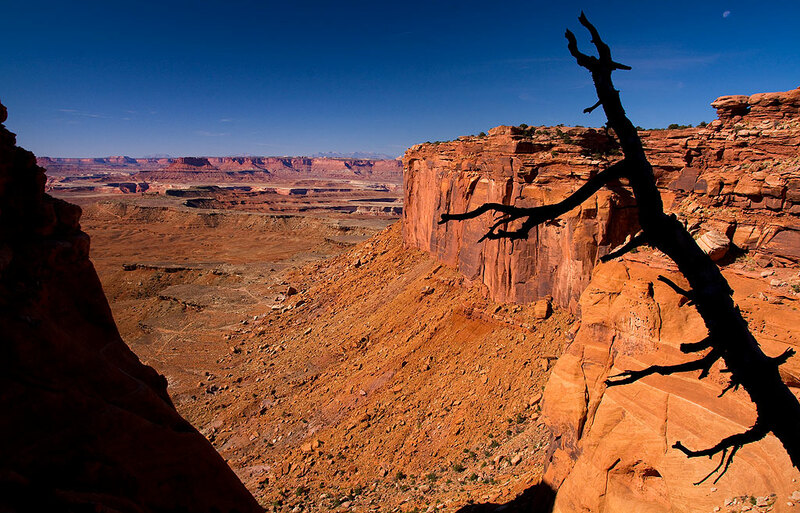 Scott’s tall frame is dwarfed by the grandeur of a bench we crossed as we descended into Elephant Canyon from Chesler Park at Canyonlands. Farther down the descent into Elephant Canyon is this long switchback situated on a slickrock bench. I hadn’t been on this trail since 2002 and forgot how much I like it. 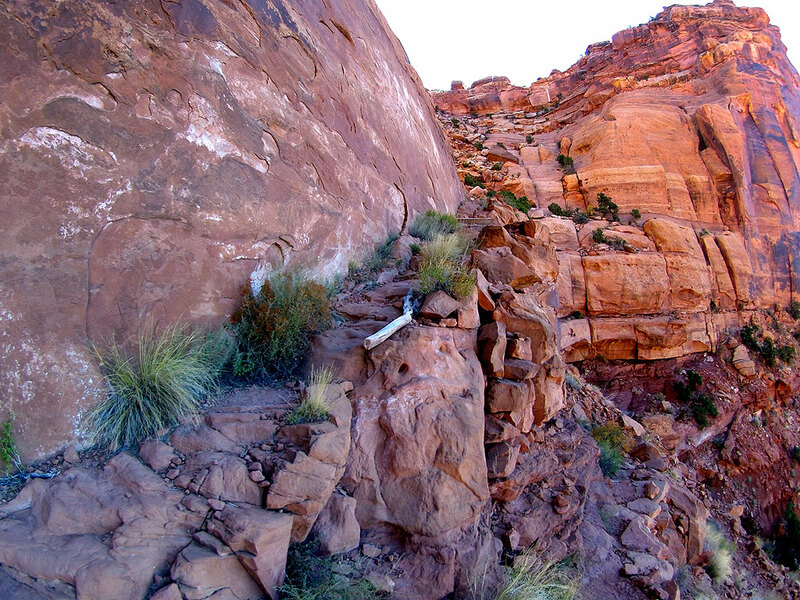 I made an image from this same spot on the descent into Elephant Canyon in 2002, but with very different light. It was nice to stand in the same spot and remember making the image 14 years earlier. 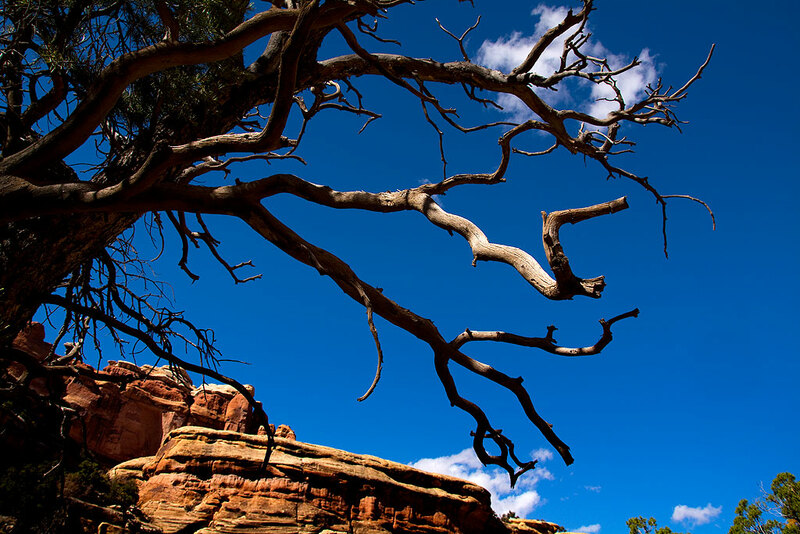 Moving north in Elephant Canyon toward the trail head, I photographed this dead tree against a perfect sky. On the way back to Monticello, Scott and I stopped to photograph these rock climbers at Indian Creek. 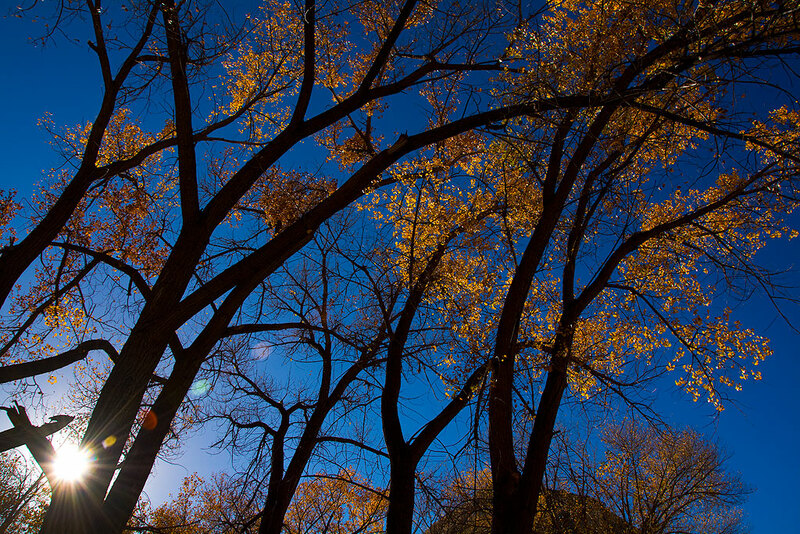 Just a mile or two beyond the rock climbers at Indian Creek is the creek itself, which supports these towering cottonwoods, shown here against brilliant sunshine and perfect blue skies. If you are on San Juan County Road 244 and are looking for the Honaker Trail, look for a Y in the road with an abandoned water tank, and turn left. Abby didn’t feel like getting up early, so I set out south with some maps and a sense of exploration. 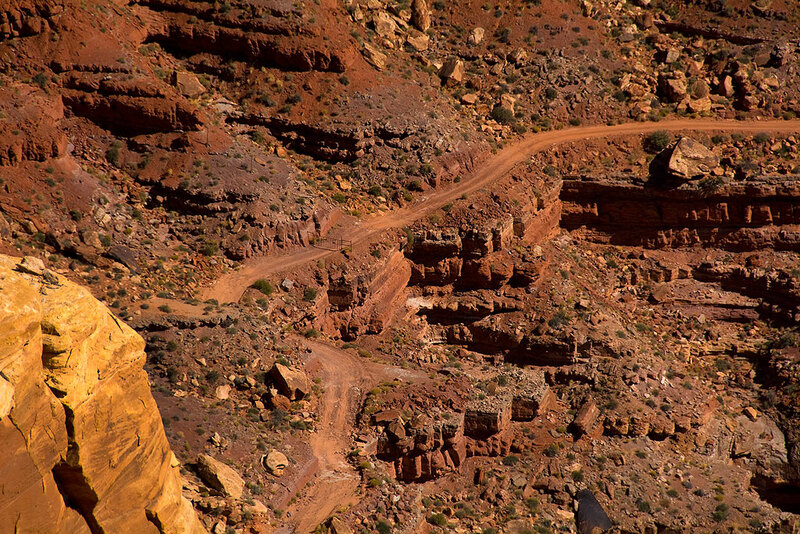 I saw the Honaker Trail on my Cedar Mesa map and wondered, as I have for years, if it would be worth a look. Near Goosenecks of the San Juan State Park, the roads are completely unmarked, causing me to miss one turn. 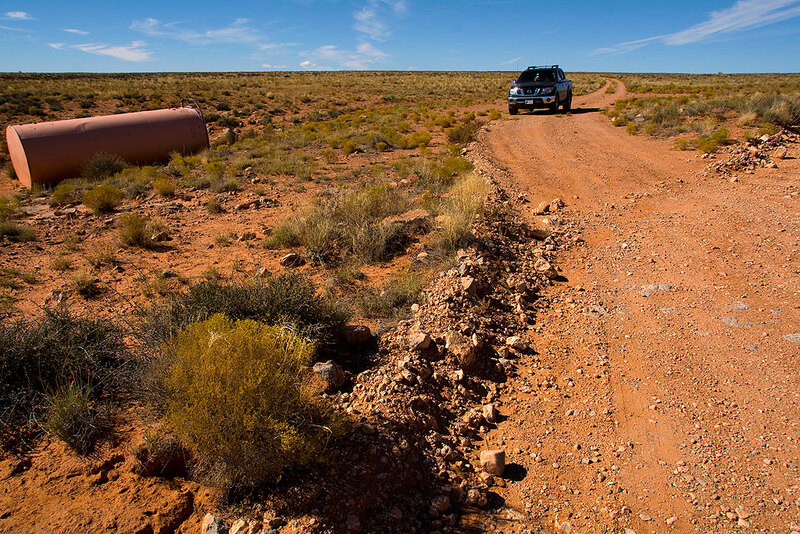 The trail head is near the end of a bona fide four wheel drive road that required using the crawling gear on our Nissan Frontier at one point. Despite roads being unmarked and sometimes requiring four wheel drive, the trail head of the Honaker Trail is unmistakable due to its enormously overbuilt cairn, seen on the right side of this image. 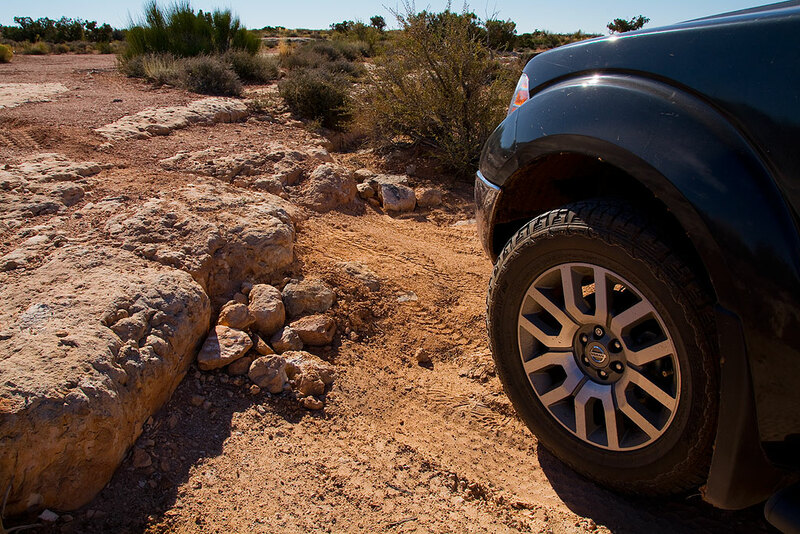 The road to the Honaker Trail is a legitimate four wheel drive affair, though our Nissan Frontier had no difficulty whatsoever. 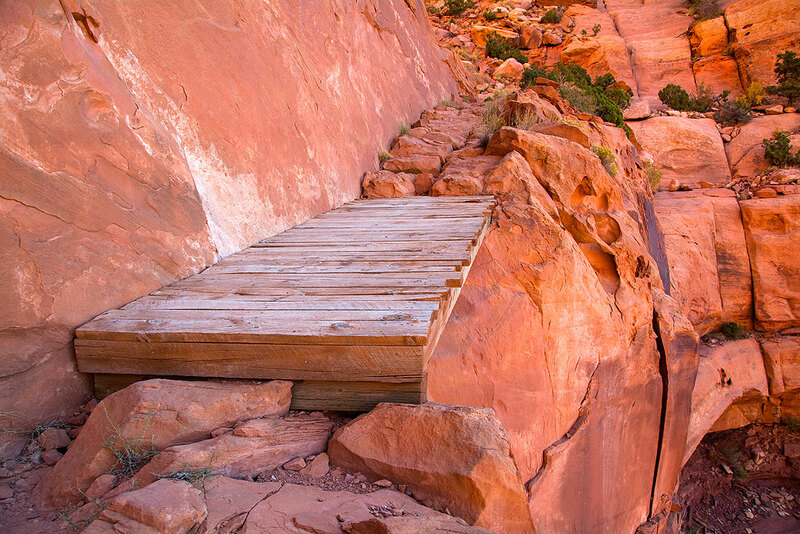 The Honaker Trail was originally built as a supply point for gold miners, but was never used as such. 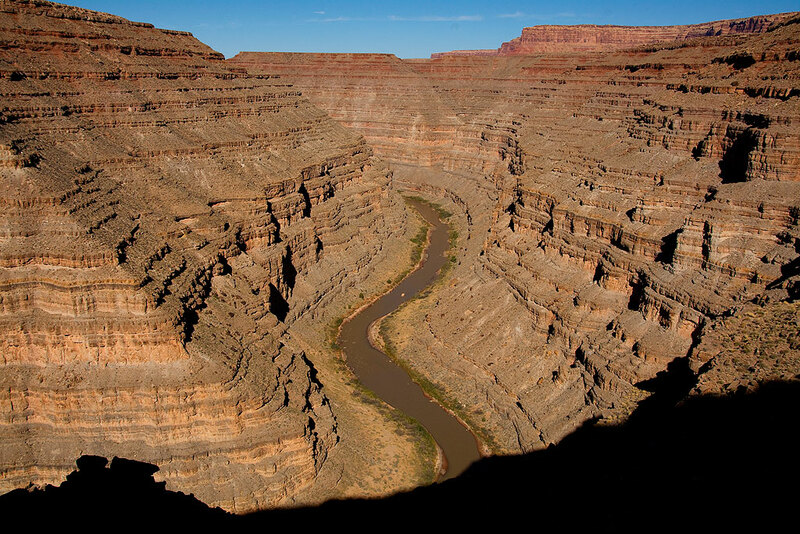 Instead, it is a study in geology, leading from a mid-level rim of erosion to the San Juan River below. Hiking down it is a simply affair, but coming back up is strenuous. Like a lot of steep trails in the region, the Honaker Trail’s footpath is rough and not very obvious. 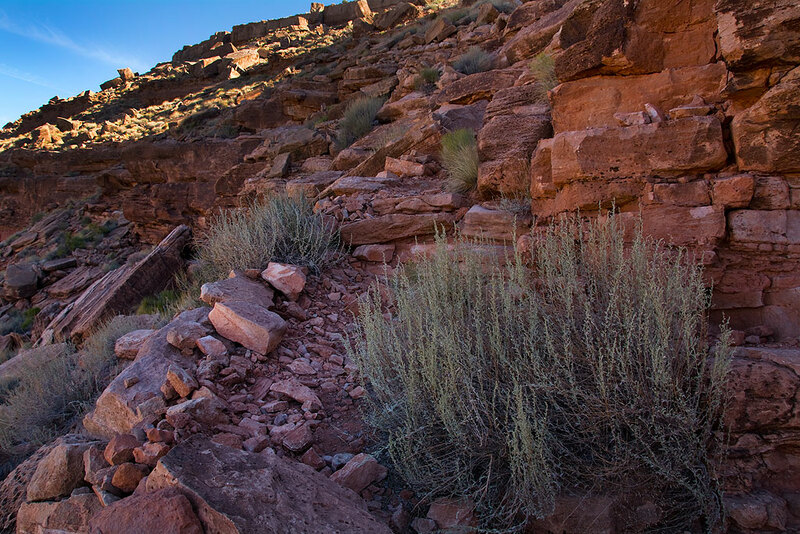 This view some of the way down the Honaker Trail shows the geologist’s dreamland of strata above the San Juan River. After the hike, I took the Frontier on down the sometimes four wheel drive road that winds around the meanders of the San Juan. I drove until I came to a gate just below Muley Point. The gate wasn’t locked, but I let it decide it was time to turn around. 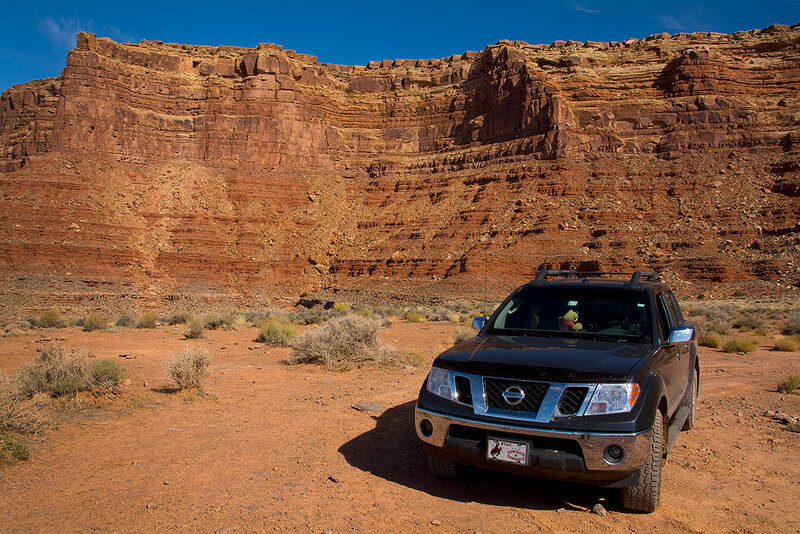 Our Nissan Frontier seems completely at home on unimproved roads and two-track paths common to southern Utah. 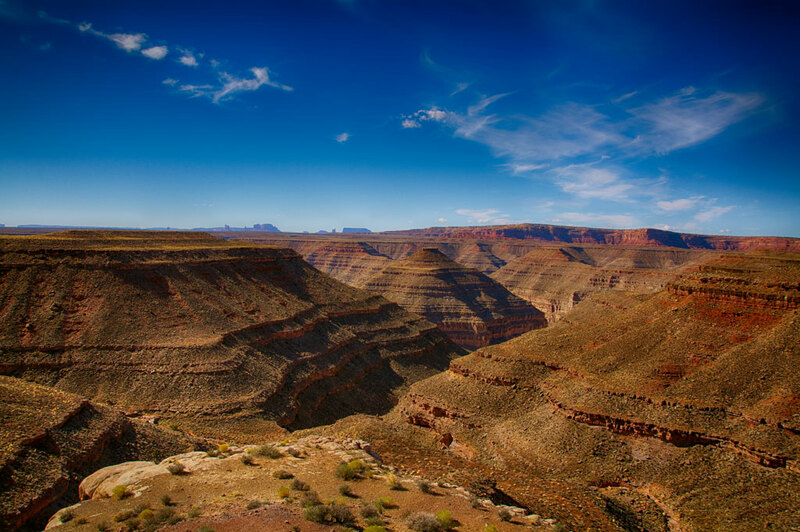 I drove to Goosenecks and made a few images, then made my way up the Moki Dugway and over to Muley Point, where I was able to pinpoint just where I’d been below it earlier. 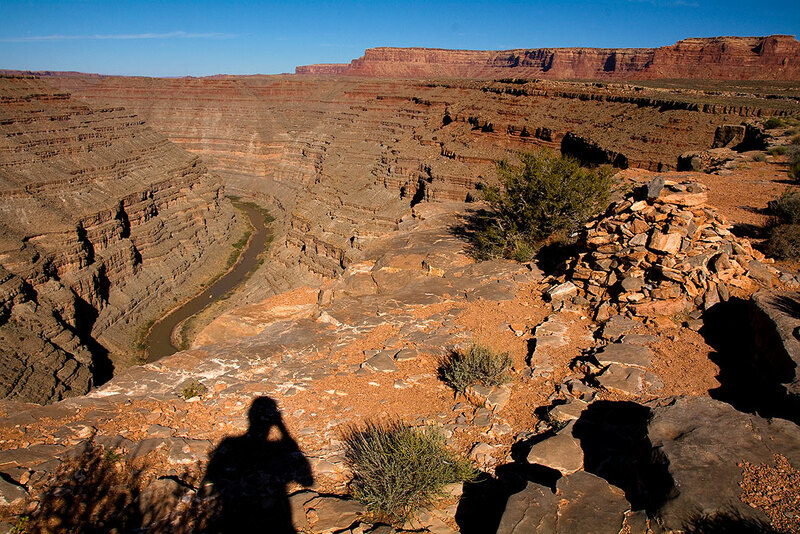 This is a fisheye image of Goosenecks of the San Juan, uncurved using Adobe Photoshop. 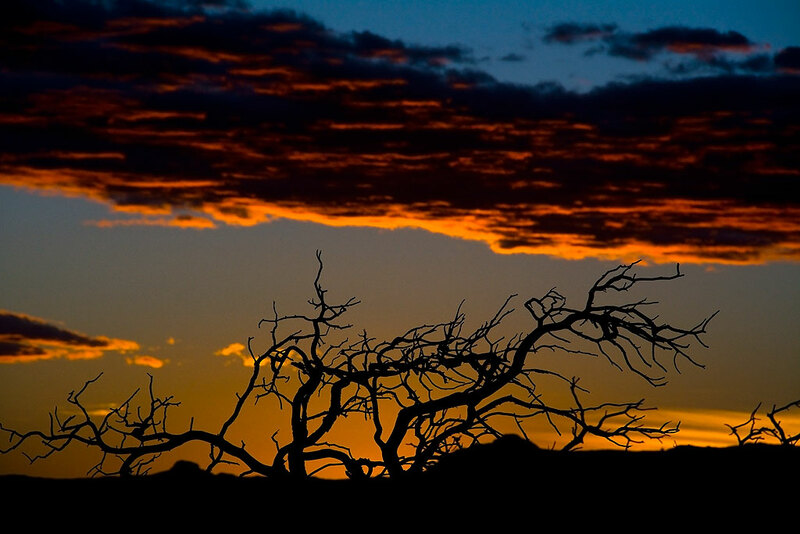 The sky continued to perform beautifully as I made my way down the four wheel drive road below Muley Point. This is the San Juan County road I traversed less than an hour earlier, viewed from Muley Point. 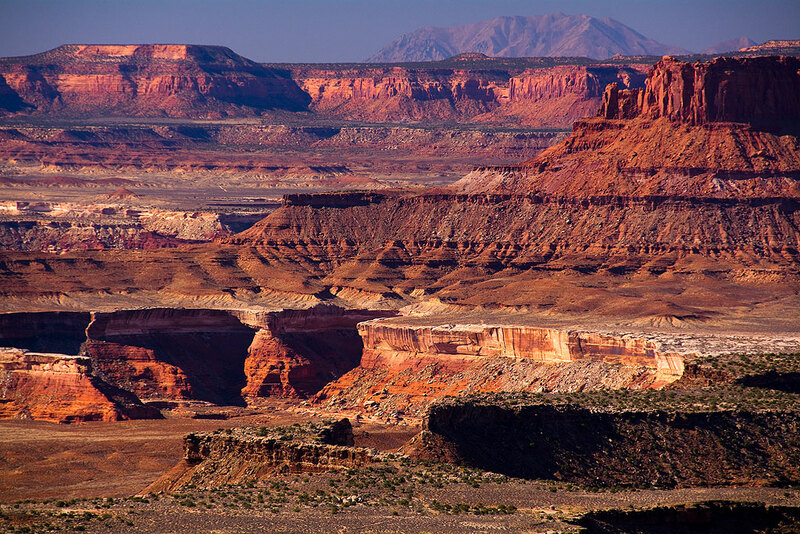 The main appeal of Muley Point is the view, which extends up to forty miles on a clear day. 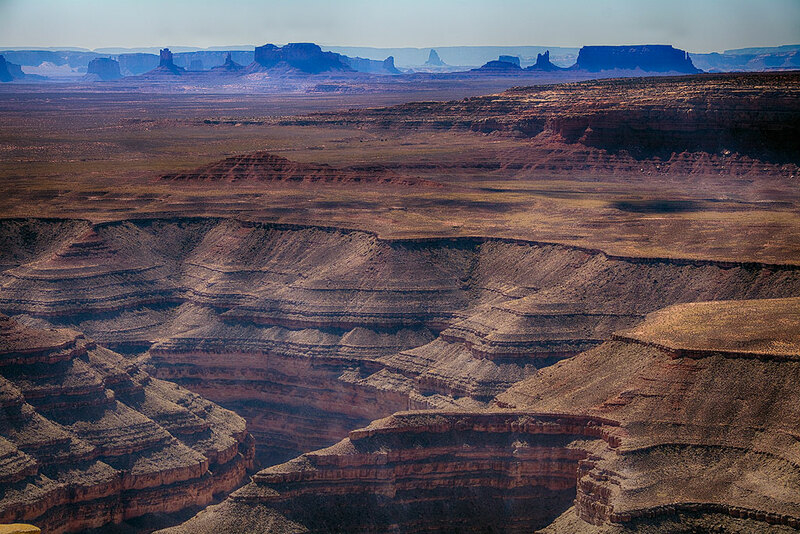 On the horizon in this image is Monument Valley. 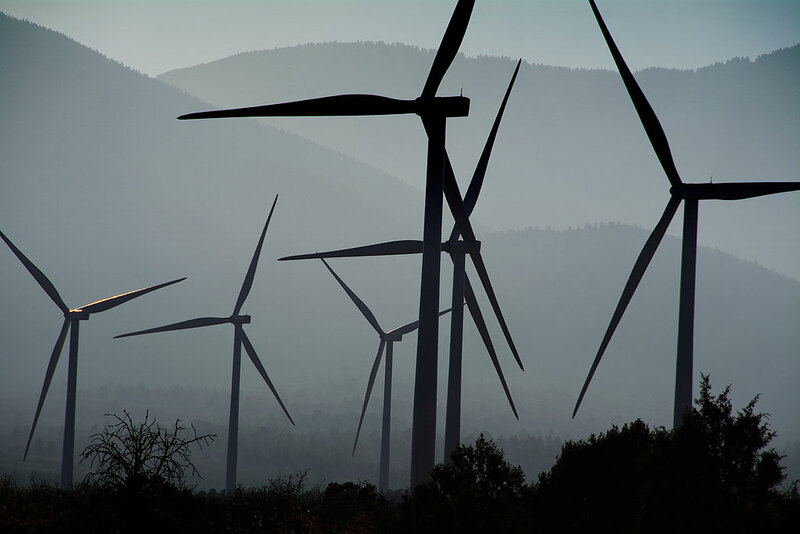 I spotted a fire south of the Abajo Mountains near Monticello with smoke drifting north; later I capture this wind farm in the smoke. This feature is new, since we didn’t see it when we were through just two years earlier. 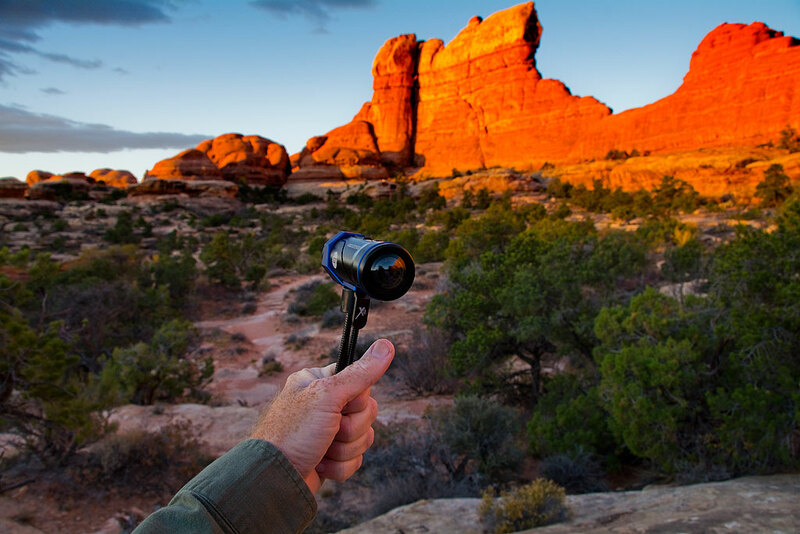 My Nikon D7100 sits on its tripod to make images of the Needles Overlook at sunset. Finally, I wanted to be somewhere photogenic at sunset, and picked the beautiful and easily-accessed Needles Overlook at Hatch Point. I had the place nearly to myself for a cold, windy, beautiful sunset. 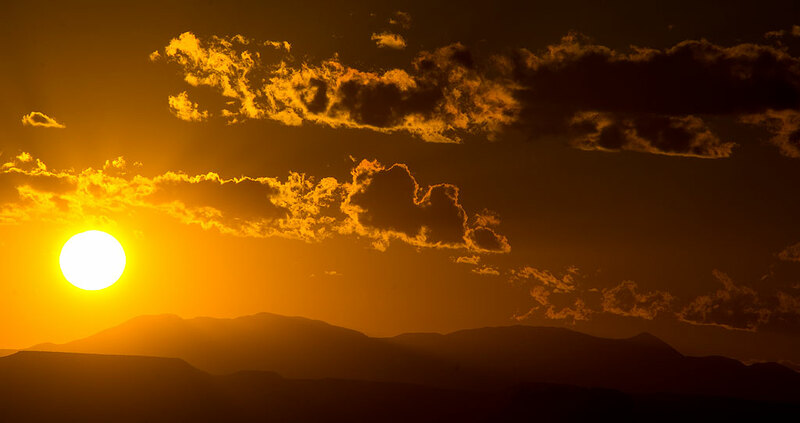 The setting sun creates crepuscular rays through the distant Henry Mountains viewed from the Needles Overlook. 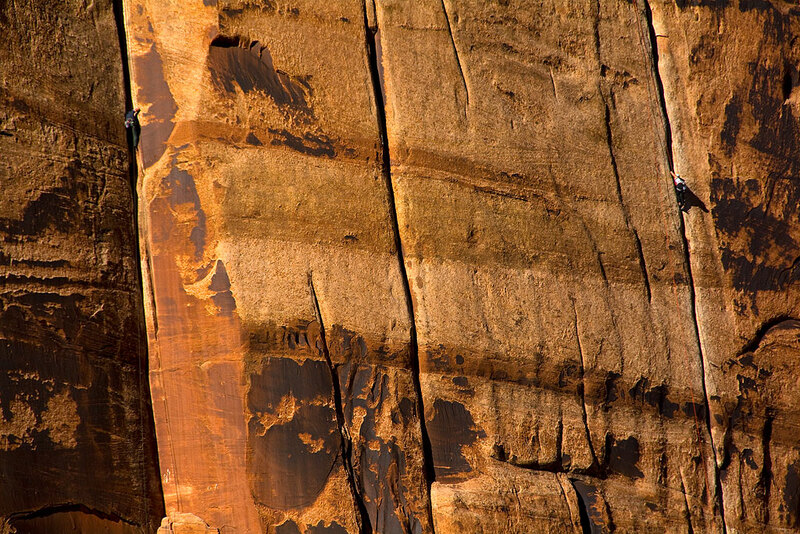 Wingate Sandstone cliffs of Hatch Point pick up evening light at the Needles Overlook. 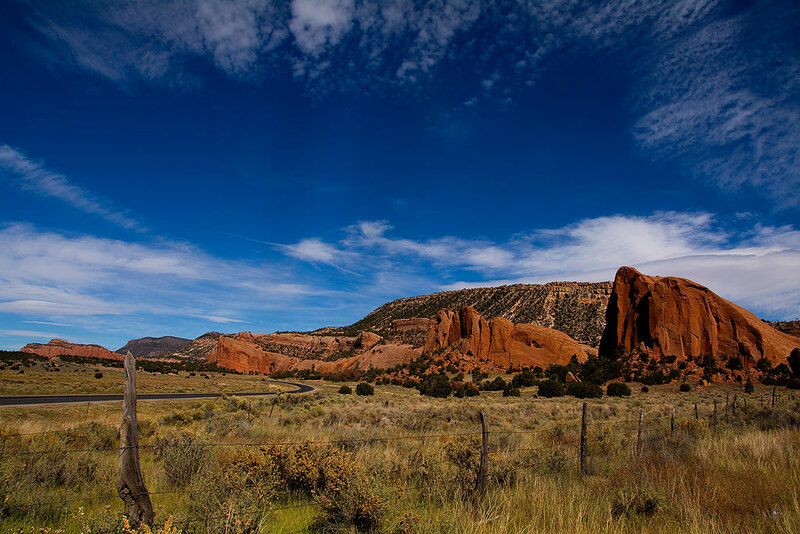 This is a five-frame high dynamic range image of the Needles Overlook made with my 10-17mm fisheye, uncurved in Photoshop. 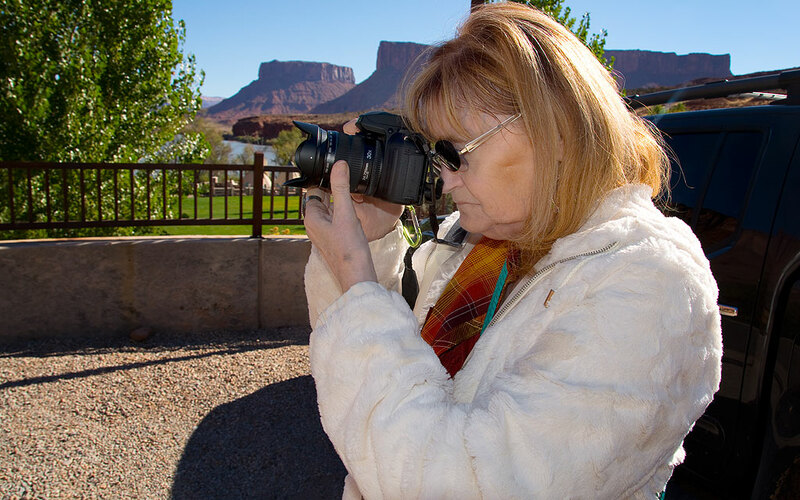 Abby photographs the Moab Museum of Film and Western Heritage at Red Cliffs Lodge on a beautiful morning. Watching a television program some weeks ago, Abby and I saw a reference to the Moab Museum of Film and Western Heritage; from that moment I knew Abby would want to see it, particularly since many of her favorite John Wayne films were not only featured at the museum, but filmed here, in the nearby Professor Valley. 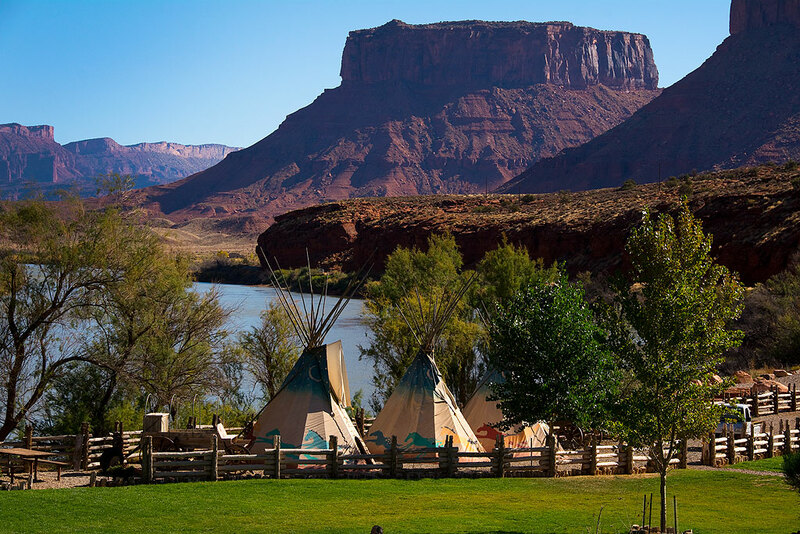 Looking east from Red Cliffs Lodge, the Colorado River and Professor Valley are visible. 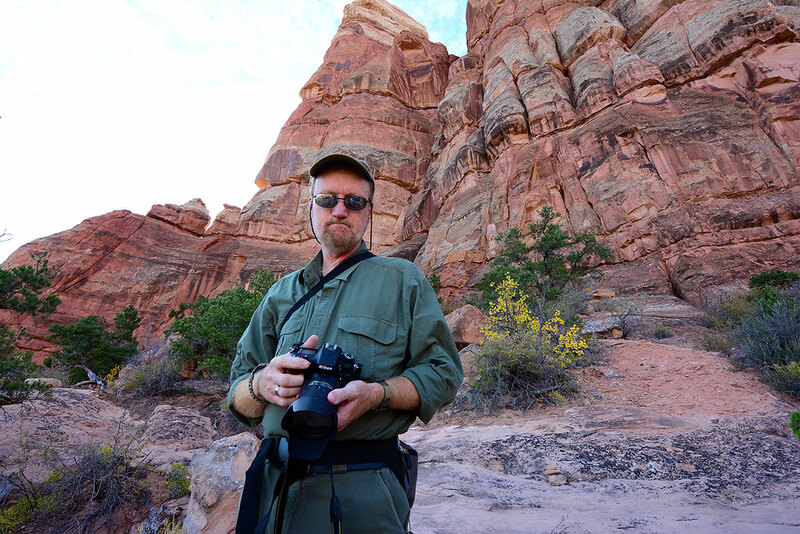 Abby made this image of me at Fisher Towers. As morning wore on, we stopped briefly to make a few photos at Fisher Towers, where she and I hiked on our third anniversary trip in 2007. From there we took the recommended La Sal Mountains Loop drive, which was nice. 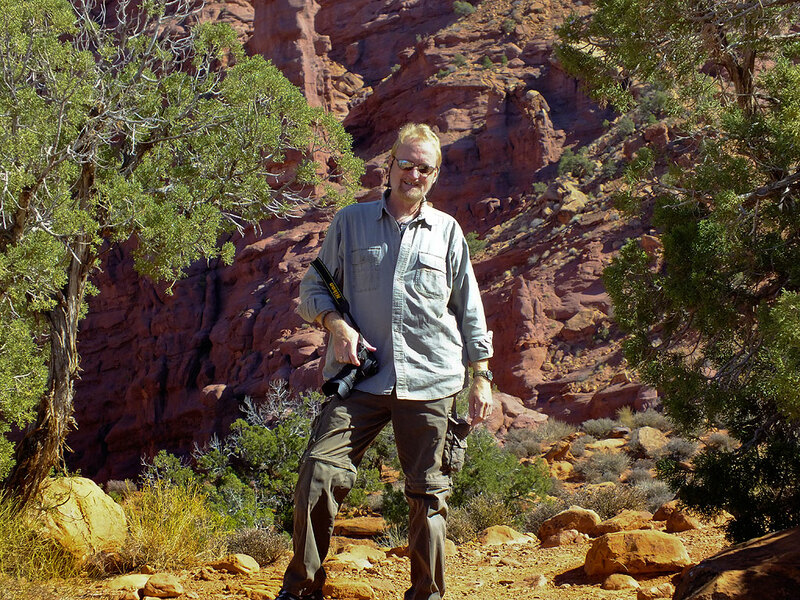 Abby makes a picture of me at Fisher Towers. Looking east from the Fisher Towers trail head is this commanding view which includes the Colorado River. 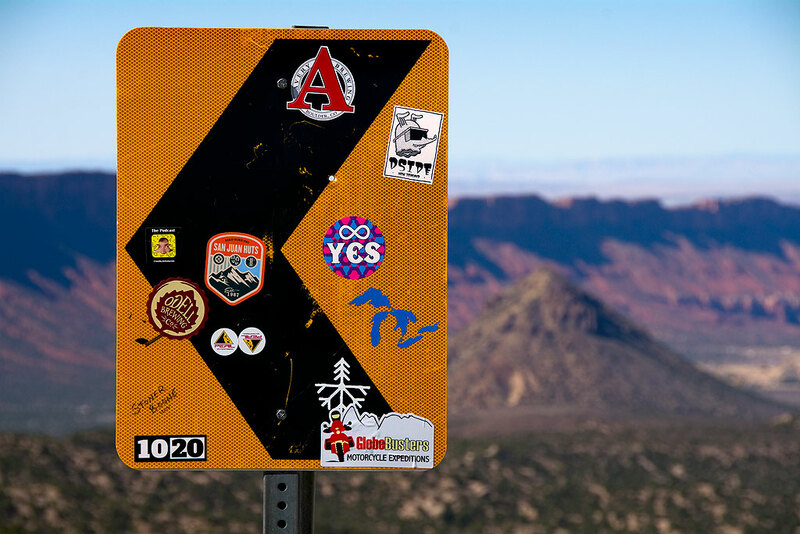 We spotted this decorated road sign on our way up the La Sal Mountains Loop drive. 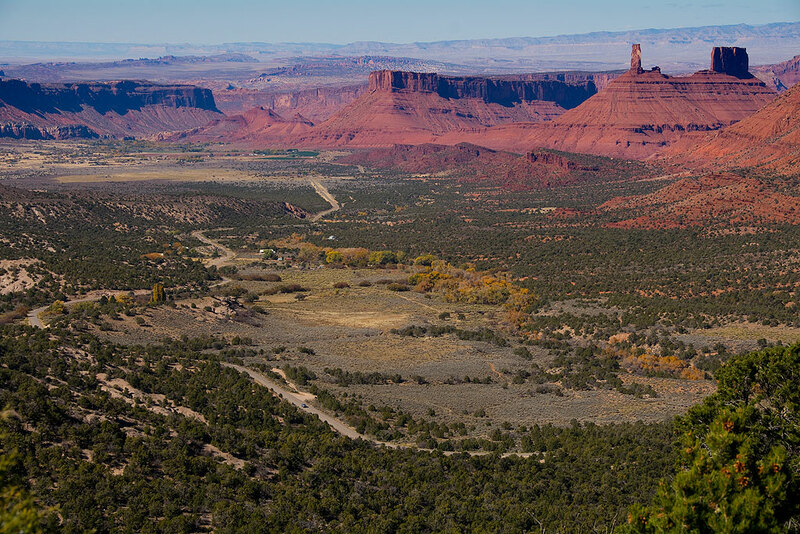 Near the top of the north end of the La Sal Mountains Loop is this view looking back on Castle Valley. 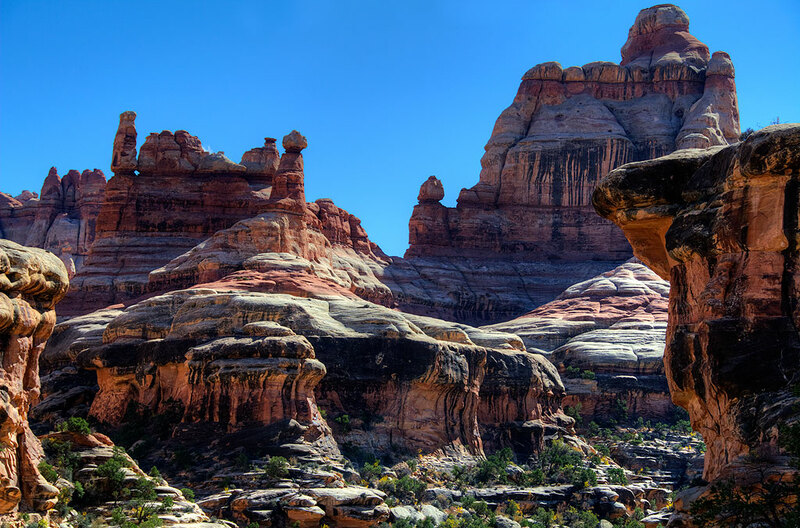 Abby decided to relax on this day, and sent me north to Canyonlands, where I set my eye on one of the steep trails that leads off the Island in the Sky District toward the White Rim, the Murphy Hogback trail. This long view looking west from the Murphy Hogback trail exemplifies everything that is truly beautiful and amazing about the American west. About two thirds of the way down the Murphy Hogback trail is this wooden bridge. The visitor center was very crowded, I guess because of the beautiful weather, and I saw a number of people at the trail head. None, however, followed me down the Murphy Hogback trail, electing instead to take the much easier Murphy Overlook trail, which I hiked on two other occasions, most recently with Jim Beckel in 2013. The going was steep and rough, descending 1000 feet, but incredibly fun. The air was cold and still, and I moved quickly. As with the Honaker Trail two days earlier, the route down was easy compared to coming back up, but definitely worth the effort. At places very steep and rough, the Murphy Hogback trail is my kind of adventure. 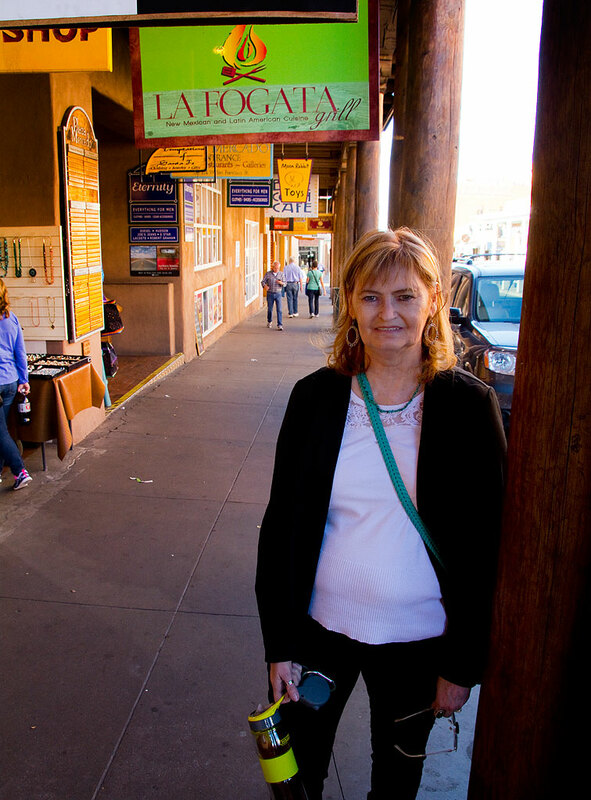 Abby smiles as we begin our walking tour of Santa Fe’s historic Plaza. 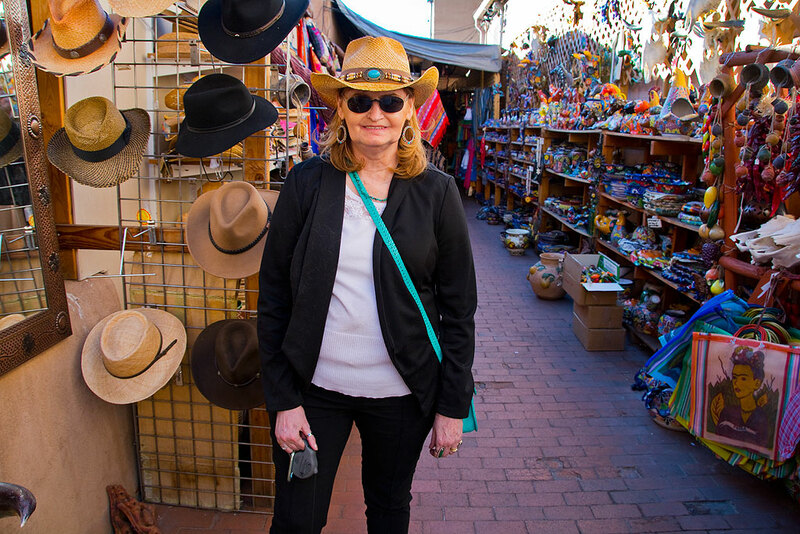 There are few places Abby likes as much as The Plaza in Santa Fe, New Mexico. 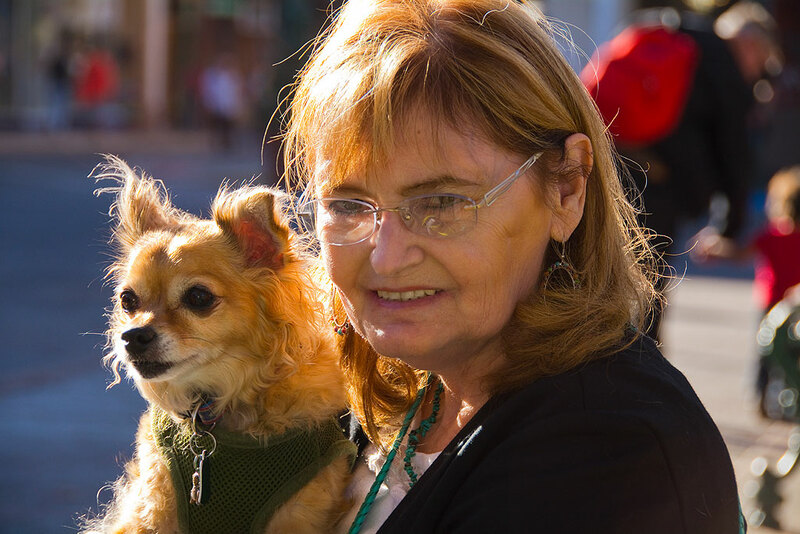 With our Chihuahuas, Max and Sierra, along for the walk, we enjoyed an afternoon of shopping and photography; The Plaza never fails to provide photo opportunities. 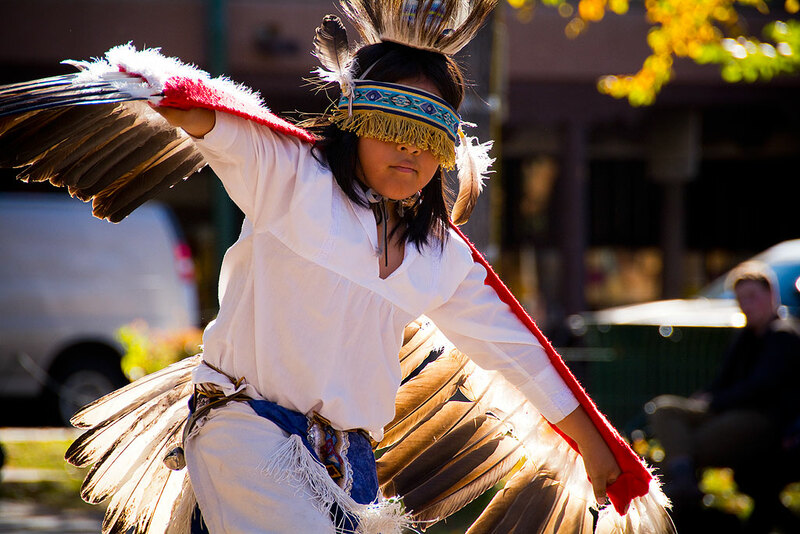 Native American dancers perform in The Plaza at Santa Fe. 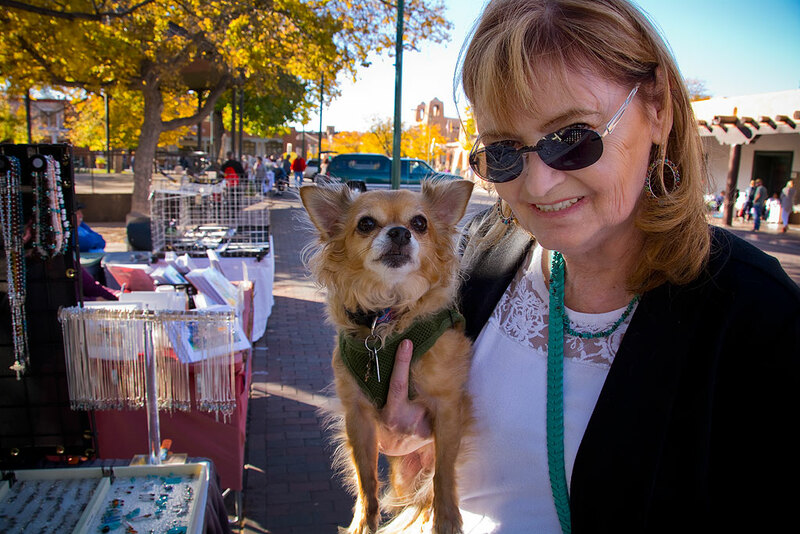 Abby holds her dog Sierra and smiles at me as she buys a piece of jewelry from a Santa Fe Plaza vendor. 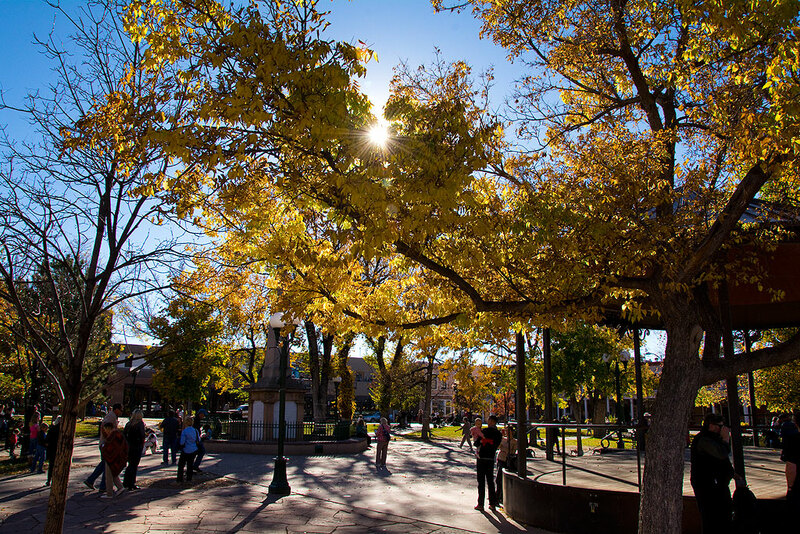 Brilliant sunshine spills through autumn-tinged trees into The Plaza at Santa Fe. 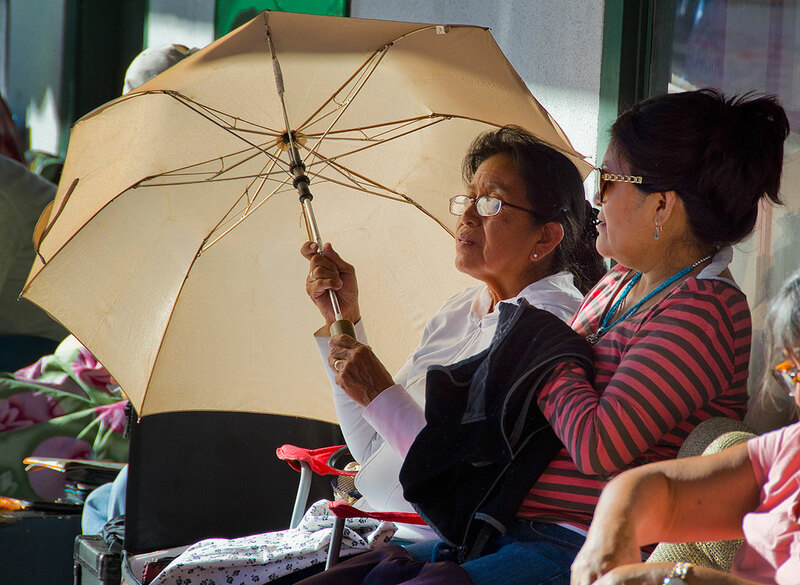 Native vendors use an umbrella as shade while they sell their wares, mostly jewelry, at the Palace of Governors on The Plaza at Santa Fe. 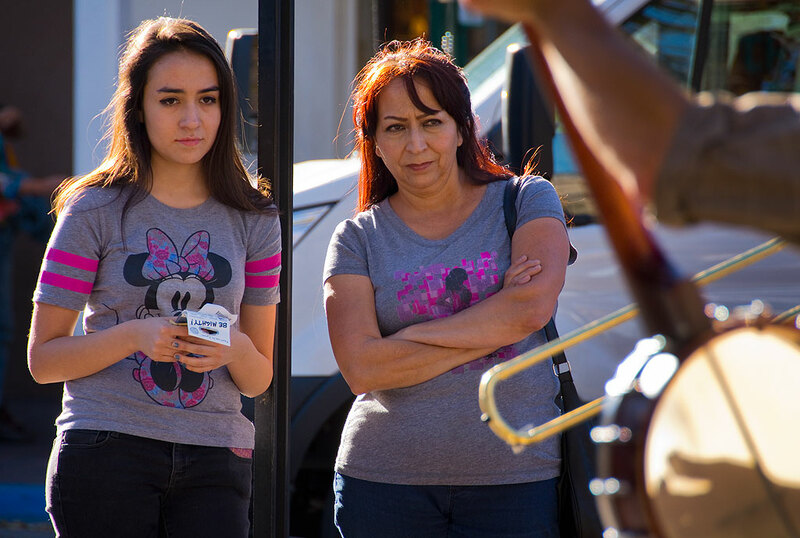 These two women listen to the Speakeasy Jazz Cats, a group Abby and I photographed on The Plaza in June. Abby bought this hat at one of her favorite shops on The Plaza. 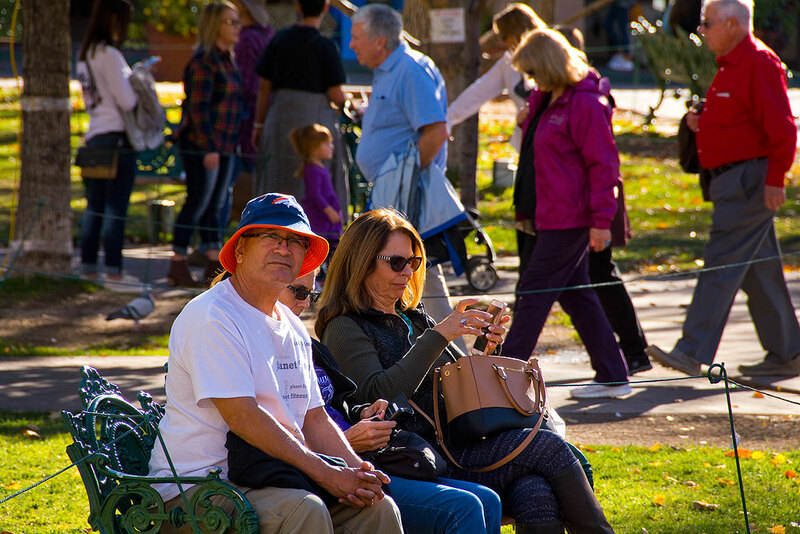 The great weather attracted many visitors to The Plaza. Abby and her dog Sierra sit for a spell on The Plaza. 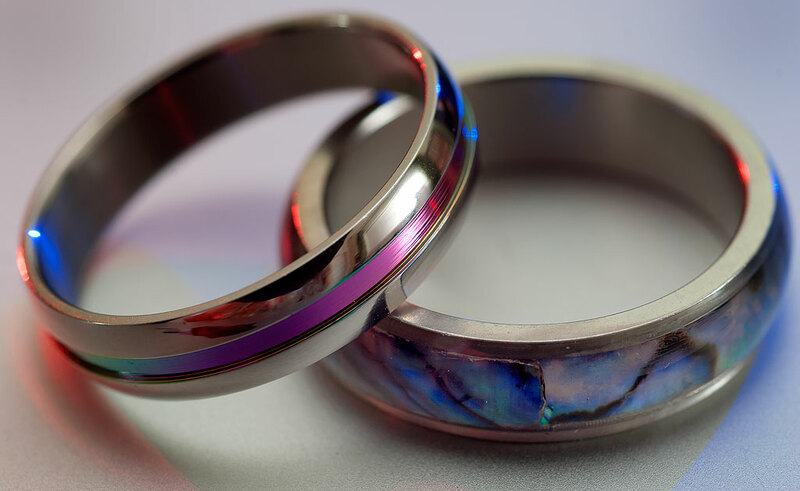 I have a whole collection of stainless steel rings like these, which I wear on the ring finger of my right hand, and which always remind me of our travels together. 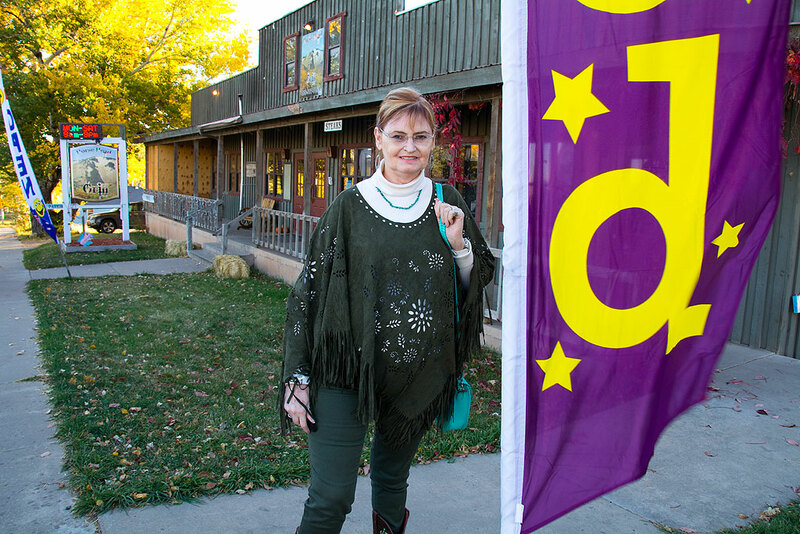 Abby is very fond of the small arts and crafts community of Madrid, New Mexico, which she and I visited for the third time. 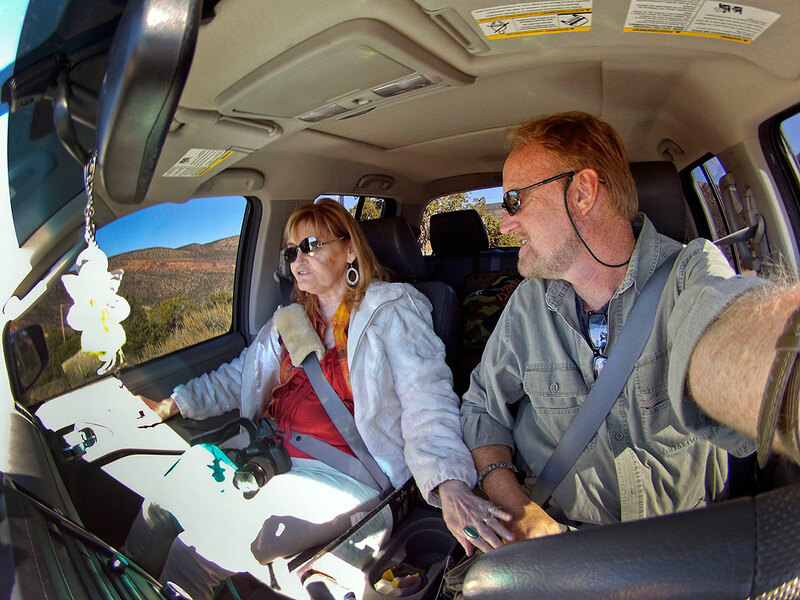 We then started our trip east toward home, stopping at Cline’s Corners, New Mexico for lunch and two or three more souvenirs, including two more “travel rings” for me. 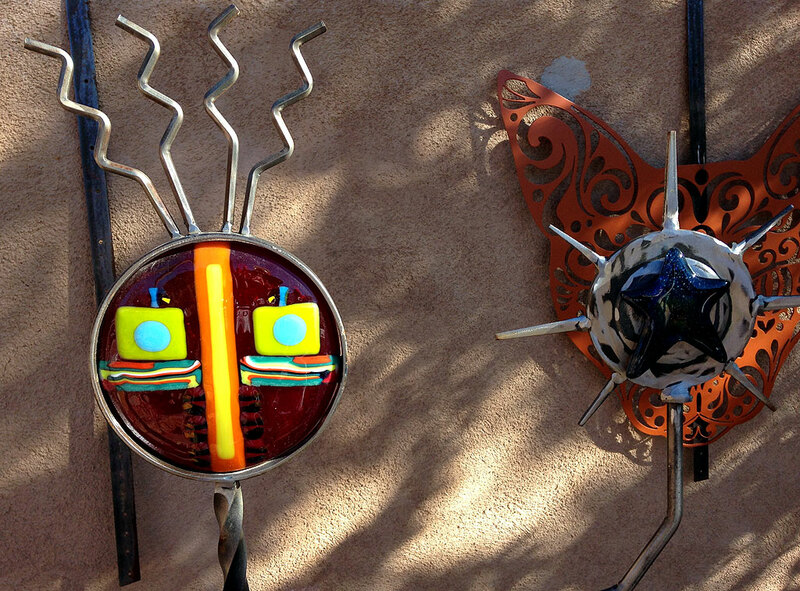 Art like this is on display all over the town of Madrid, New Mexico. 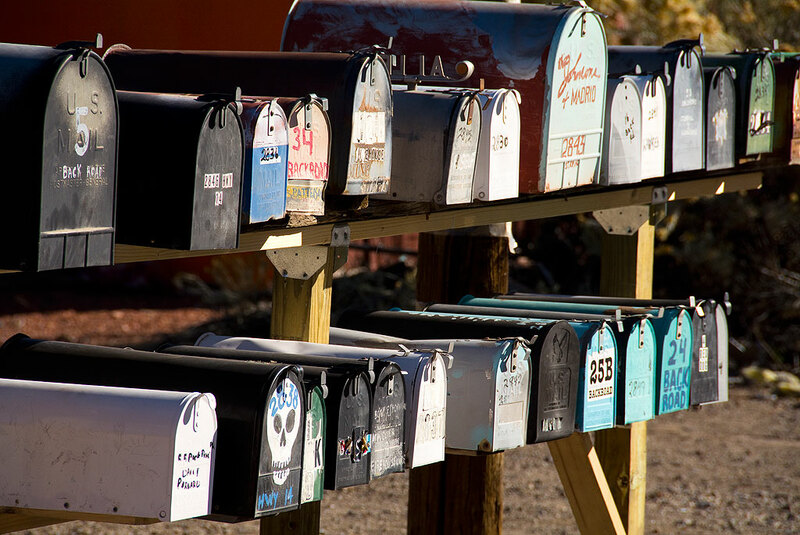 Since there is only one road in Madrid, New Mexico, the mailboxes are clustered together along the highway at several locations, including this one on the south end of town. 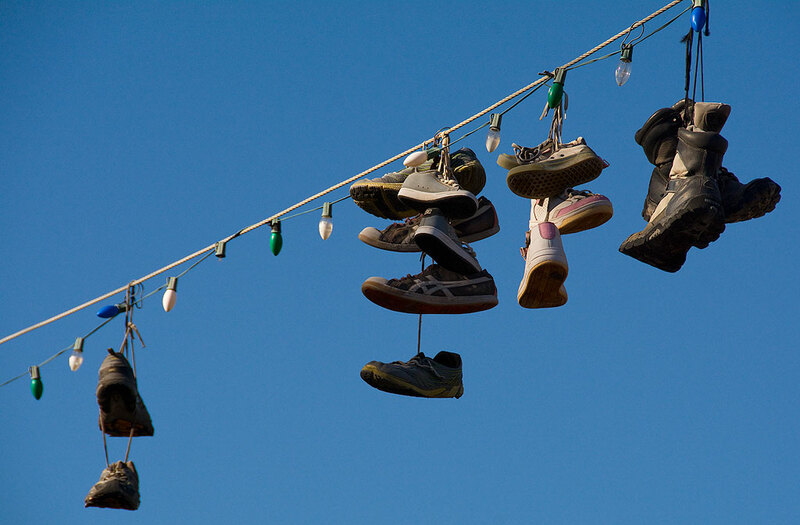 Shoes hang on an overhead power line in Madrid, New Mexico. By early afternoon we were in Las Vegas, New Mexico at the Old Town Plaza. I wanted to take Abby to this location because one of our favorite shows, the Netflix Original drama Longmire, is filmed here, standing in for the fictional Durant, Wyoming. 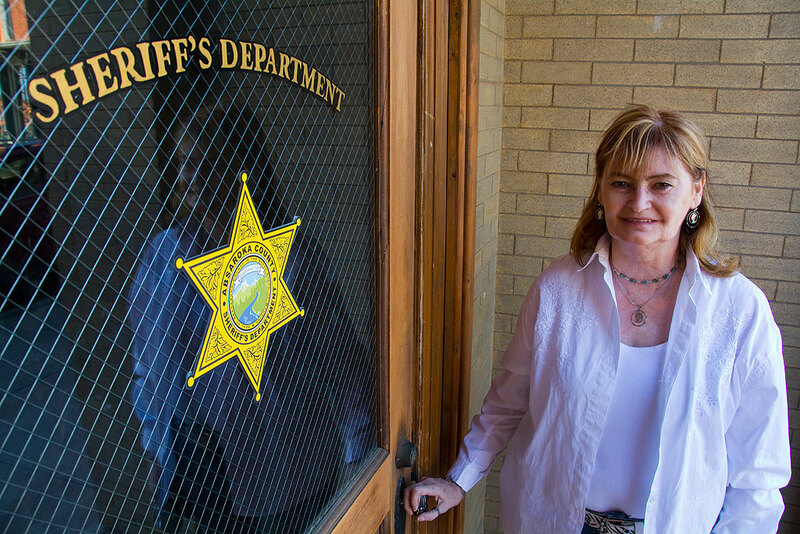 She and I recognized the locations, and found that the building used in the series as the Absaroka County Sheriff’s Office still bore the markings from the show. 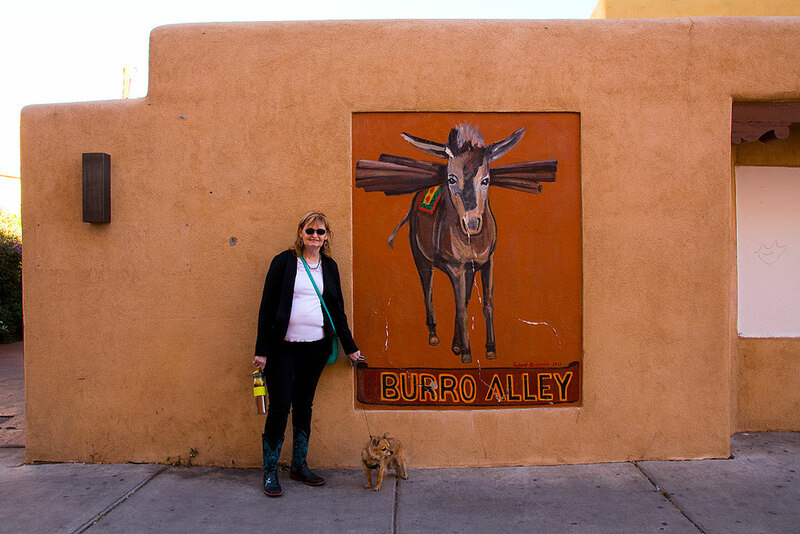 Abby poses at the door in Las Vegas, New Mexico’s Old Town Plaza that is the set for the Absaroka County Sheriff’s Office in the television series Longmire. 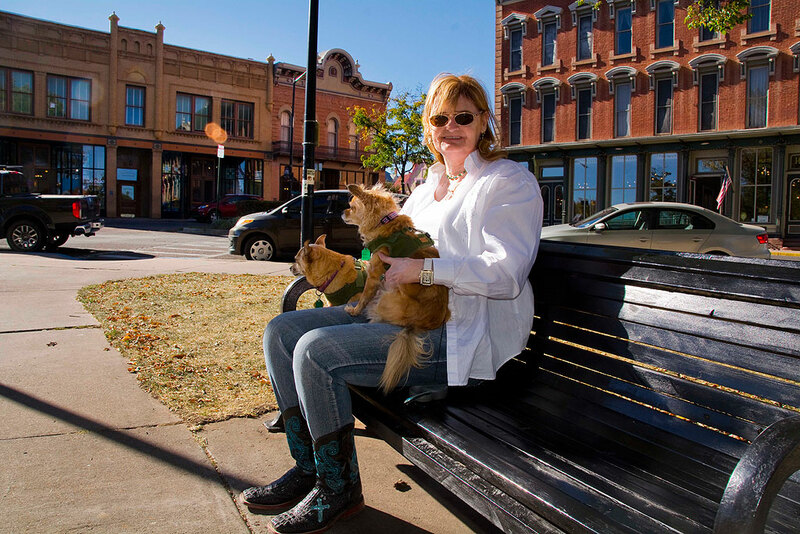 Abby sits on a park bench in Las Vegas, New Mexico’s historic Old Town Plaza, location of filming of one of her favorite television shows, Longmire. Over her right shoulder is the building that acts as the Absaroka County, Wyoming Sheriff’s Office. The door still bears the logo from the show set in Durant, Wyoming, but filmed entirely in New Mexico. 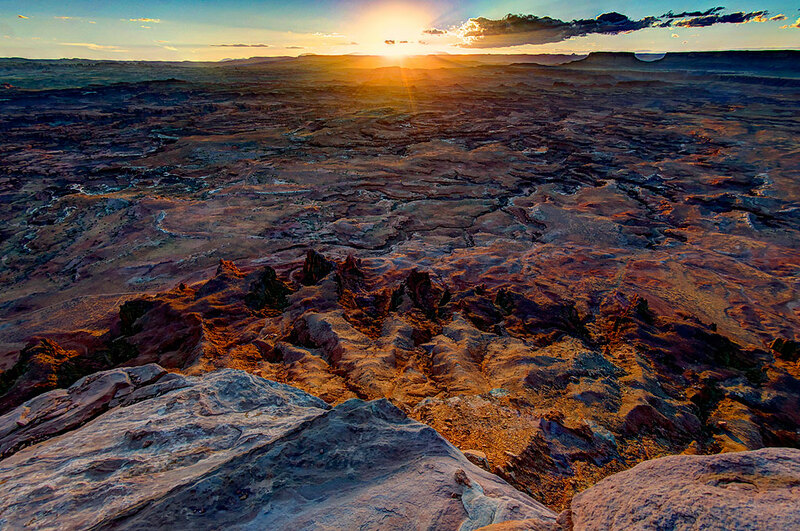 The sun rises on the Chesler Park Trail in the Needles District of Canyonlands National Park, Utah. Of all the places I have visited and hiked in the American West, I think this might be my all-time favorite.